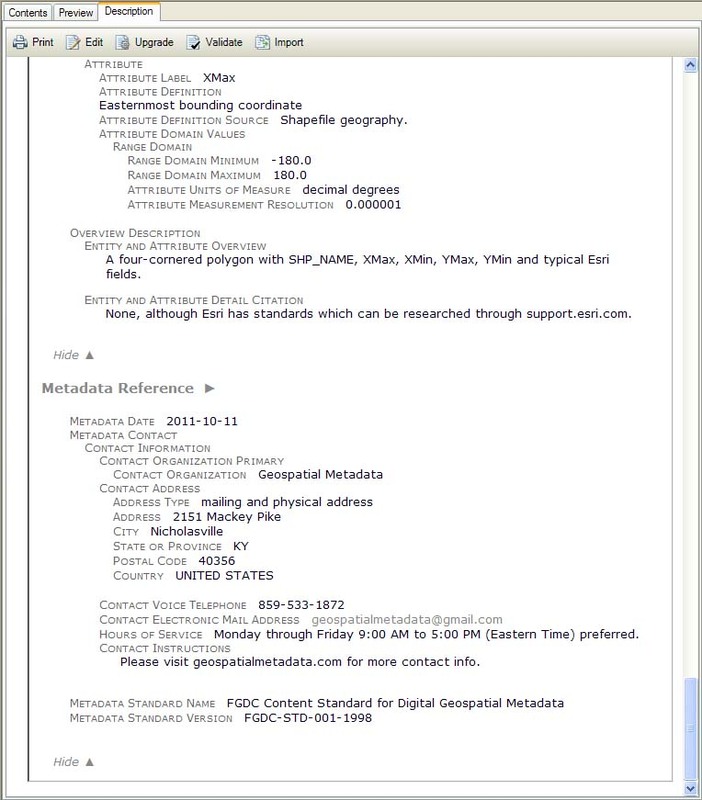 ArcGIS metadata is mysterious. Here's how I am puzzling through it. 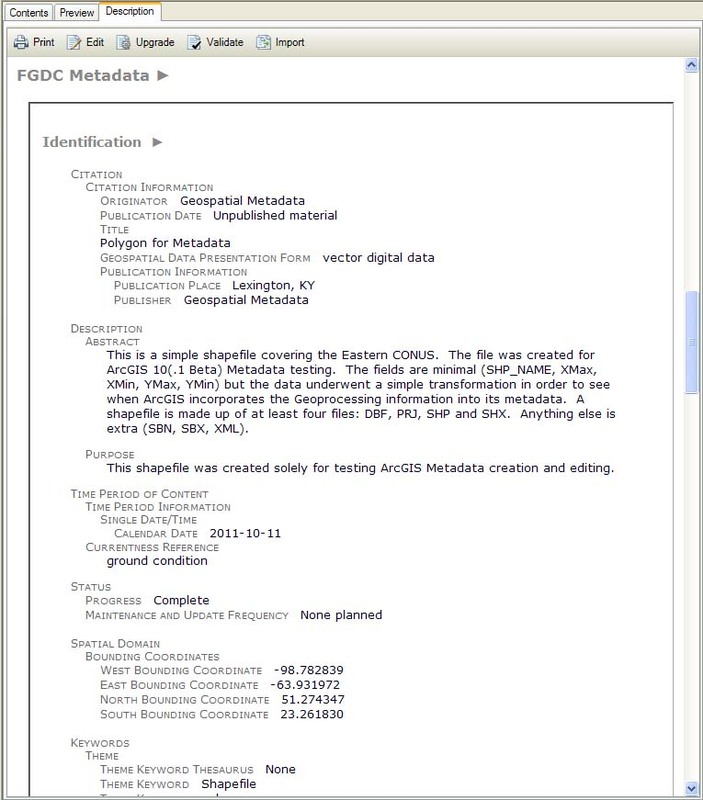 USGS FGDC MP report for PolygonForMetadata_Project.shp.xml after Metadata Importer. MP report: No errors! Not even a warning. 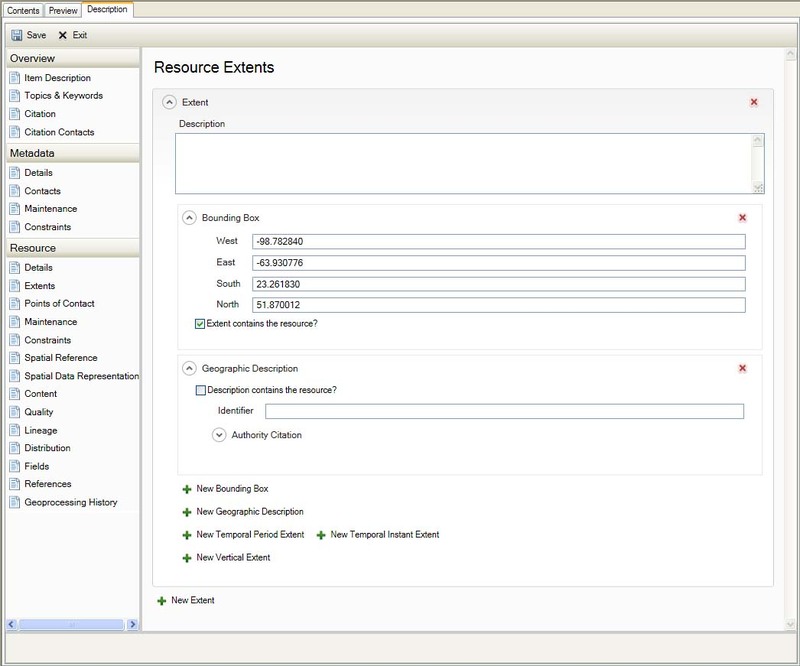 Adding Attribute information (Attribute Definition; Attribute Definition Source; Valid Attribute "range") in Resource Section > Fields. Here's the XML File ArcGIS created and Here's the MP Report (2 errors: 2 missing). The last two errors are hard to find. 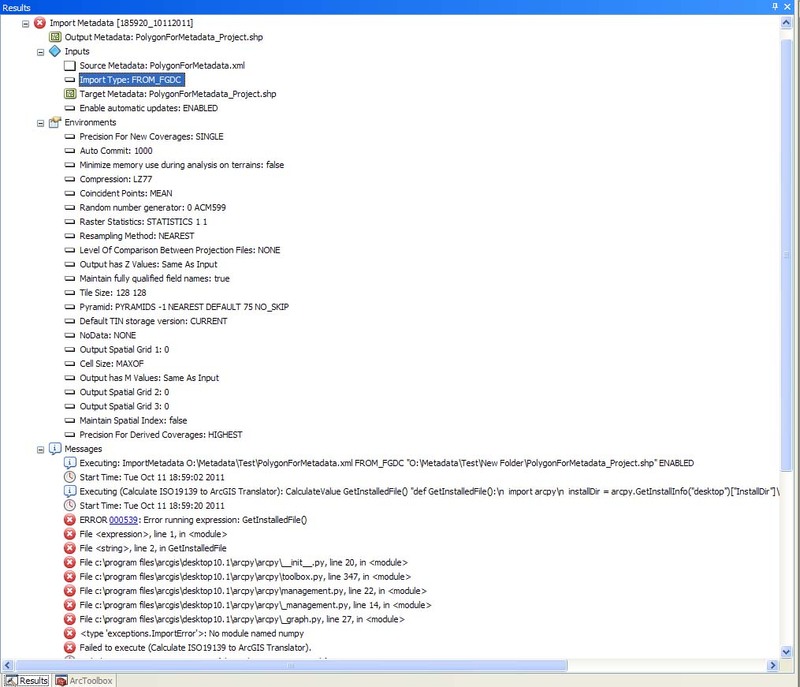 So, I created screen captures of all the editing screens. 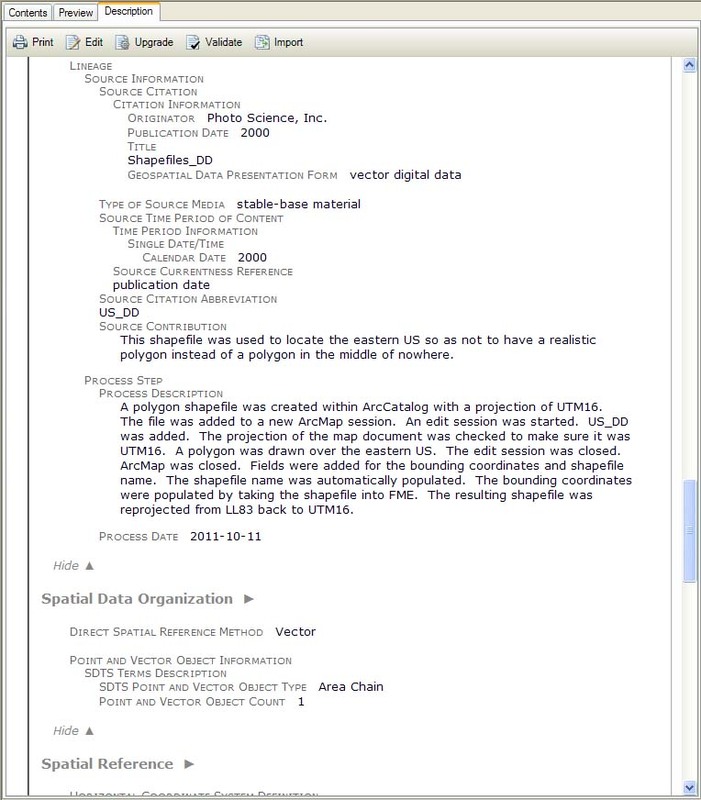 Along with screen captures of each of the editing sections, a "template" XML file was created with all of the information at the bottom of the screen. 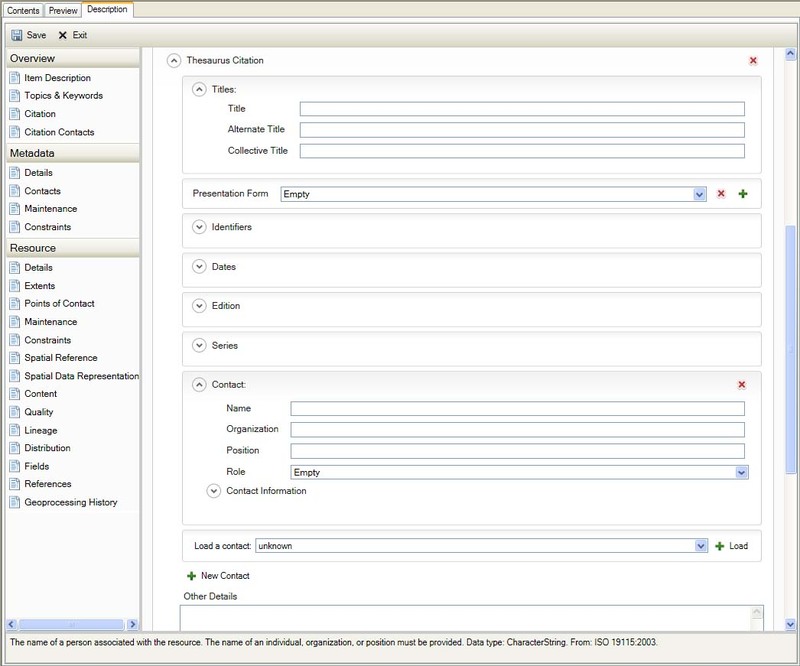 It helped to find the repetitive sections as well as document the dropdowns. 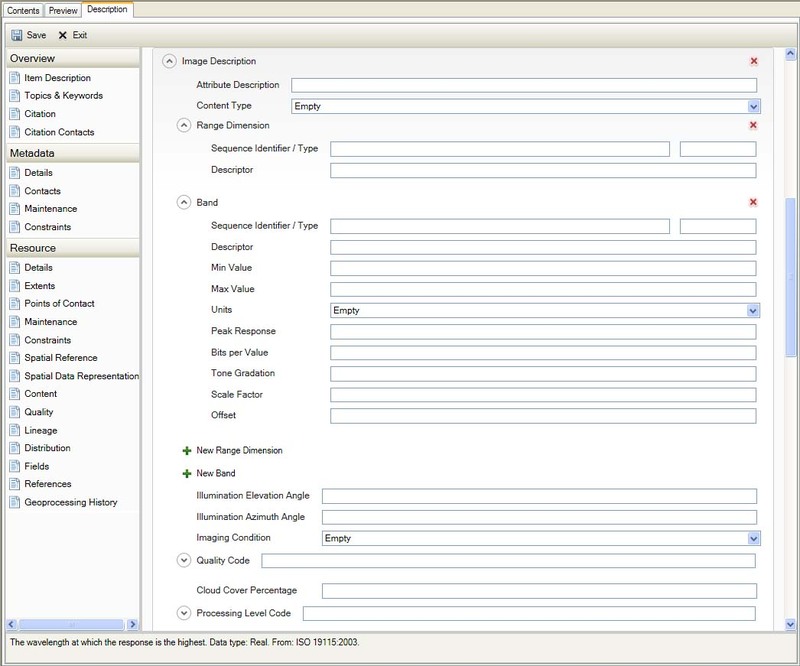 topic cateogry is required Response: checked Imagery & Base Maps check box. 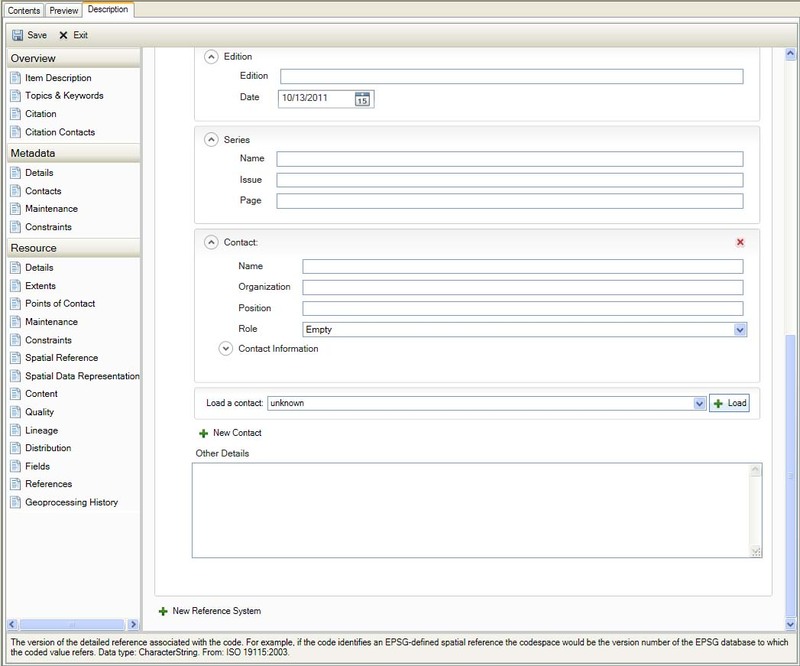 at least one date is required Response: input today's date as date created. A new, blank template was created. Each section was reviewed to see which ones are required. Required fields are indicated in red. No apparent error. 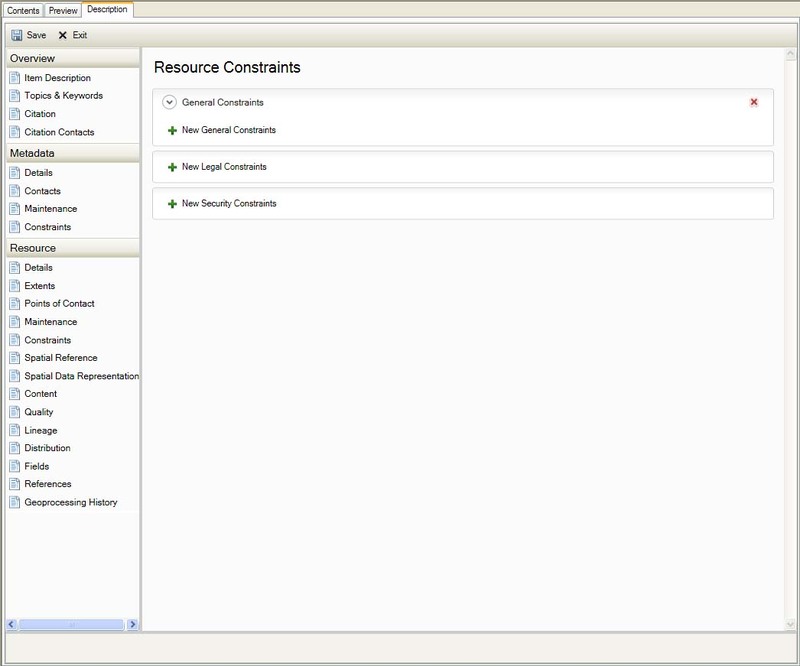 When General Constraints is added, however, it throws a Use Limitation error. This is linked to Overview:Item Descriptions:Use Limitations. 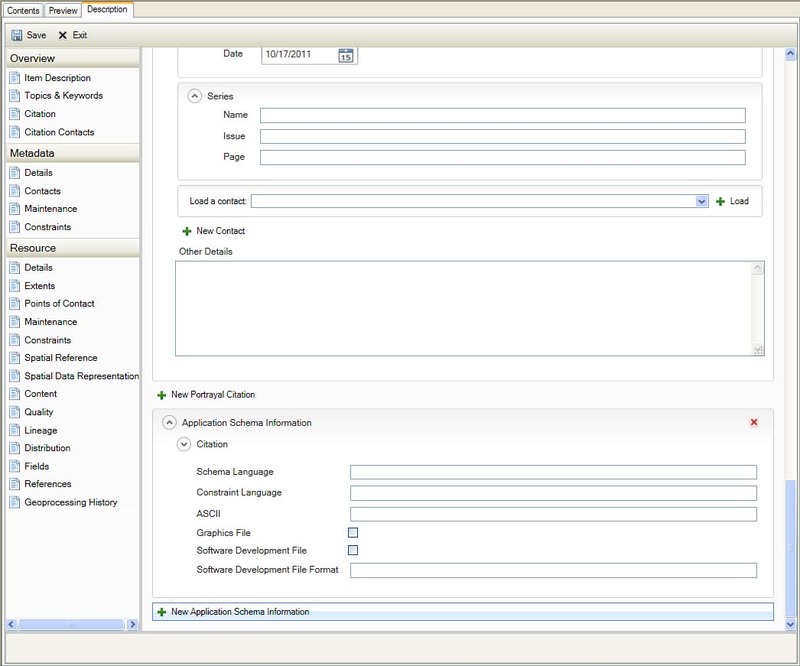 Once one is filled out, the same text is displayed in both and both errors goes away. 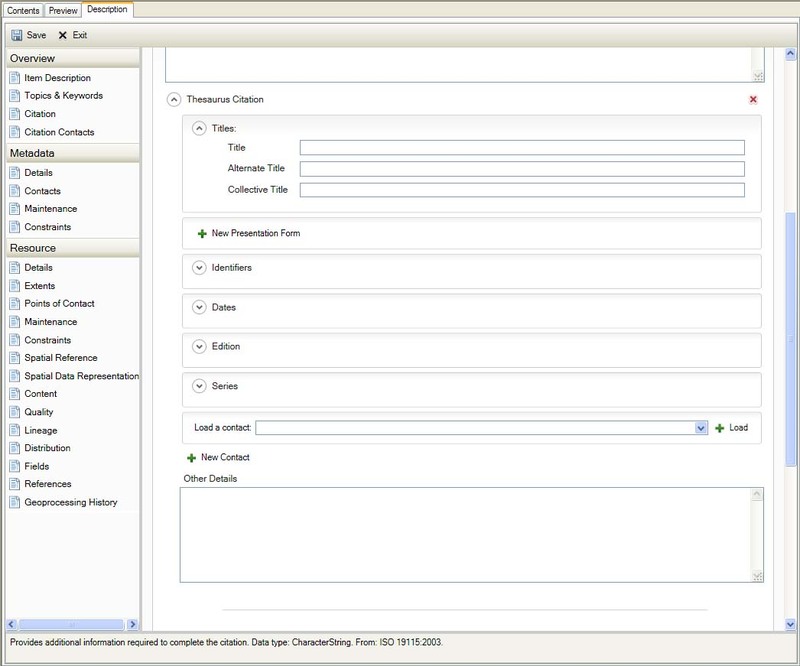 FGDC Geospatial Data Presentation Form Dropdown is repeatable. 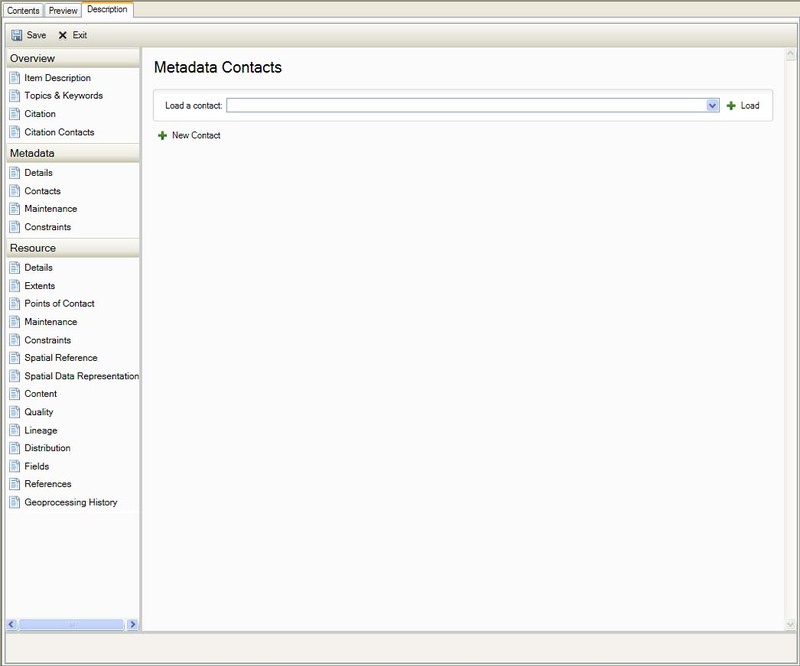 Lists all contacts used within the metadata and provides the option to save contacts. 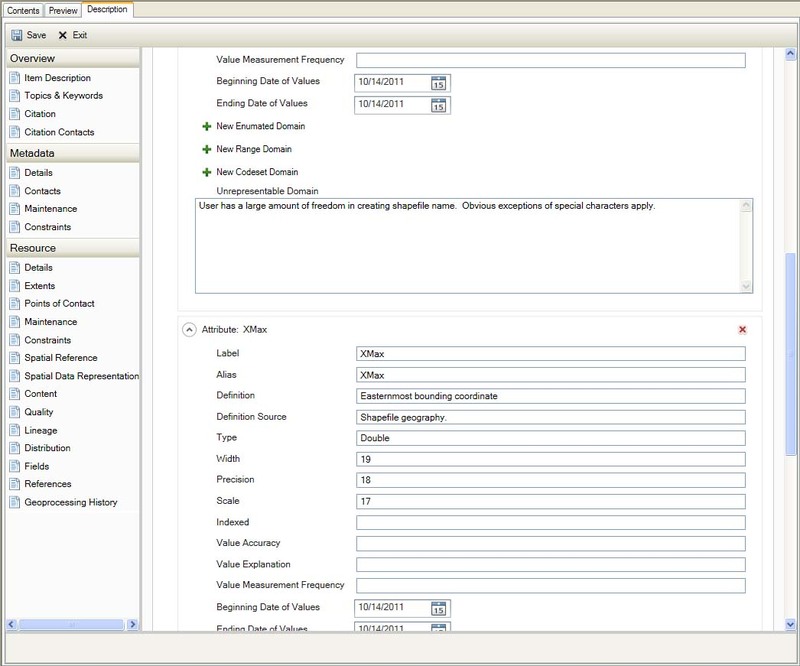 Update Scope Dropdown is repeatable. 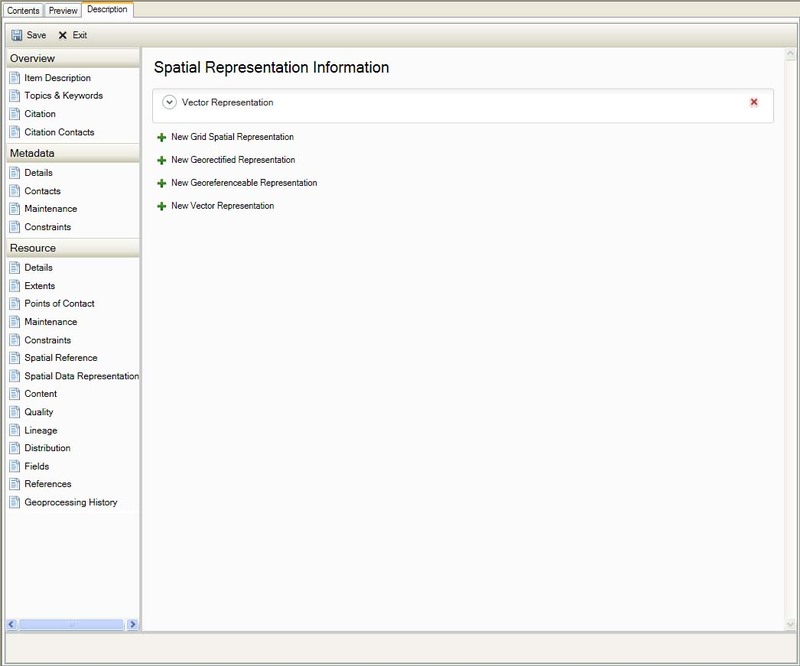 Spatial Representation Type Dropdown is repeatable. Temporal Period Extent is repeatable. Temporal Instant Extent is repeatable. 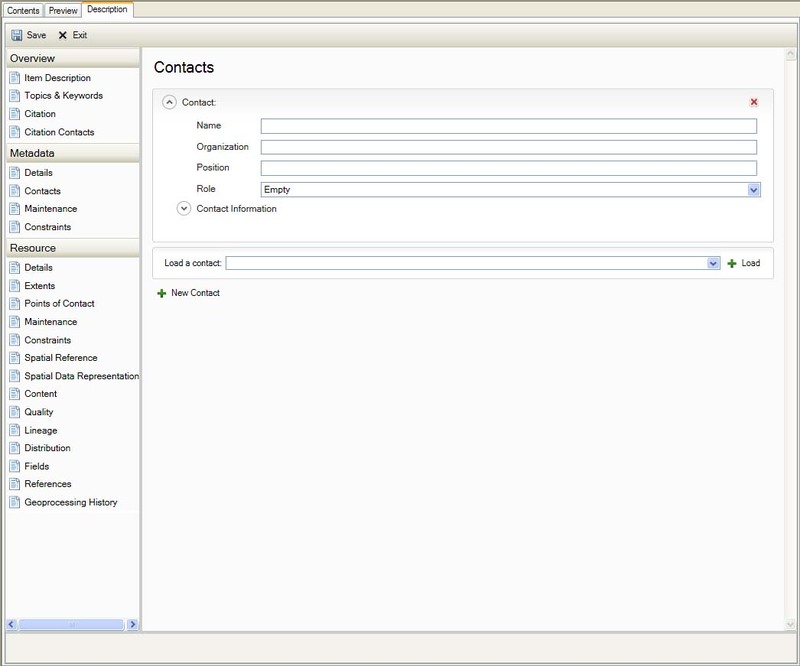 Contact is repeatable and loadable. 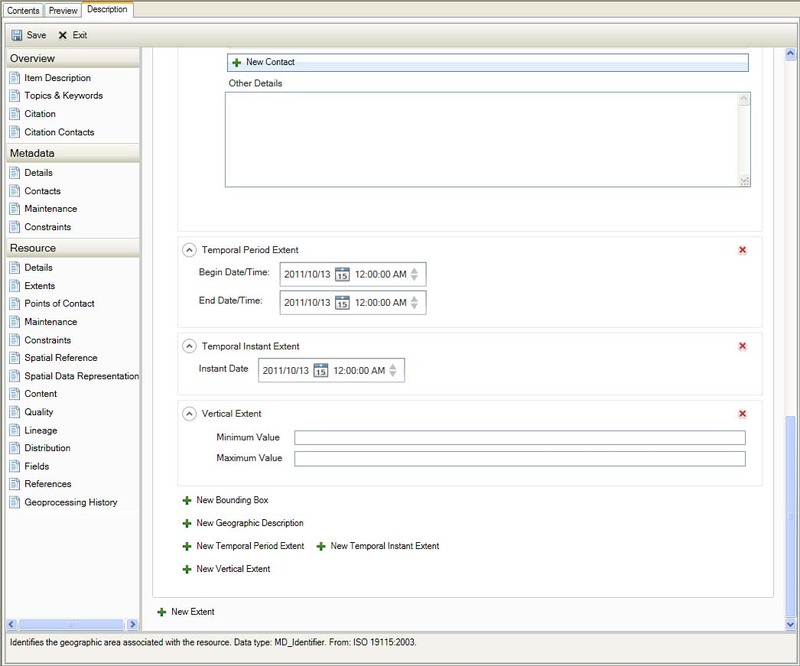 Access Constraint Dropdown is repeatable. 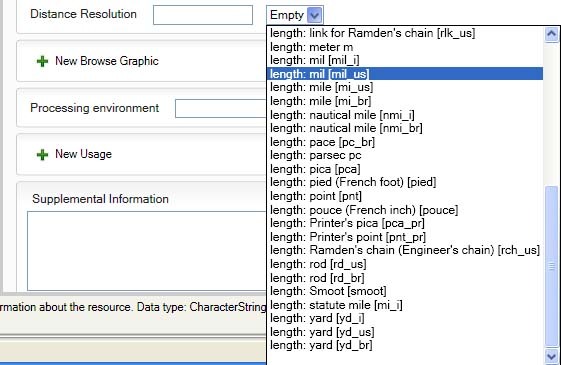 Use Constraints Dropdown is repeatable. Grid Spatial Representation is repeatable. Indirect Spatial Representation is repeatable. Feature Catalog Citation is repeatable. 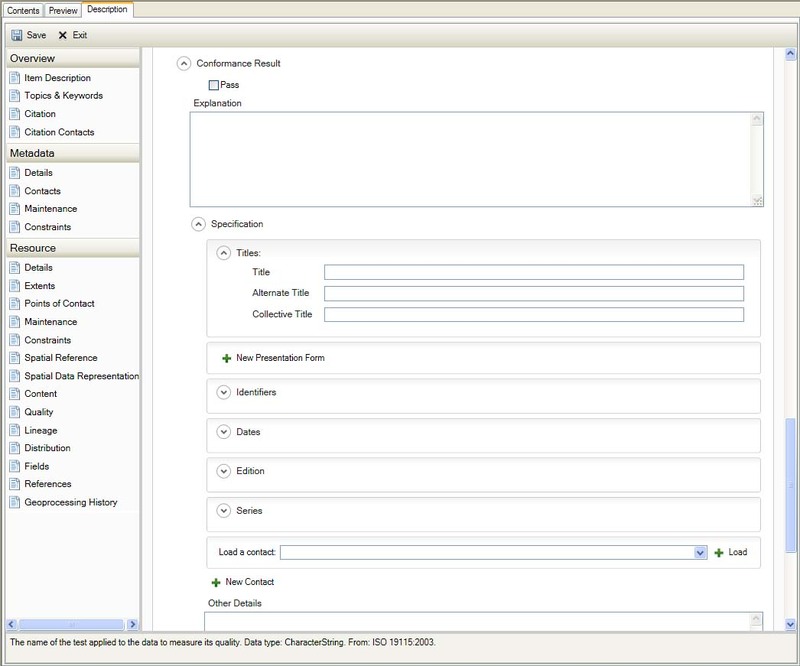 Ordering Process (Available Time Period) is repeatable. 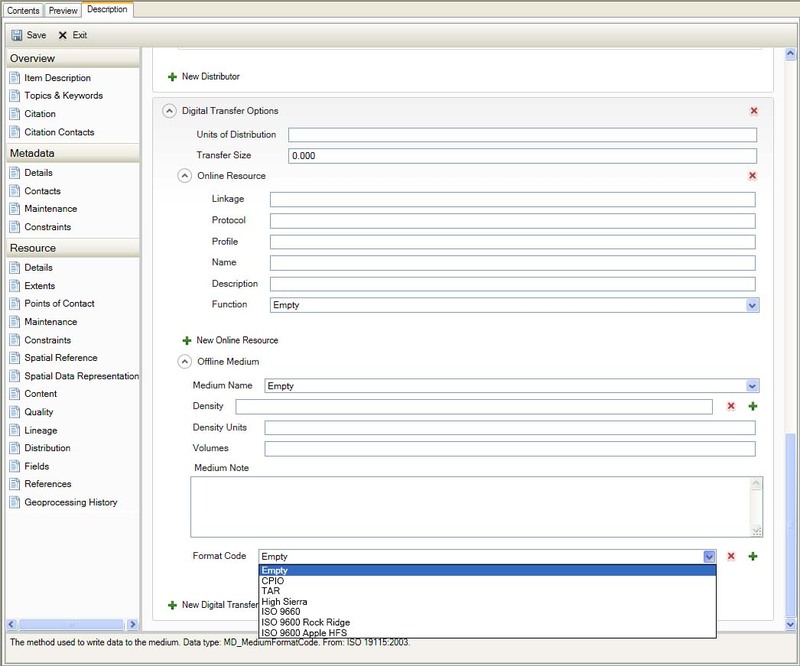 Digital Transfer Options is repeatable. 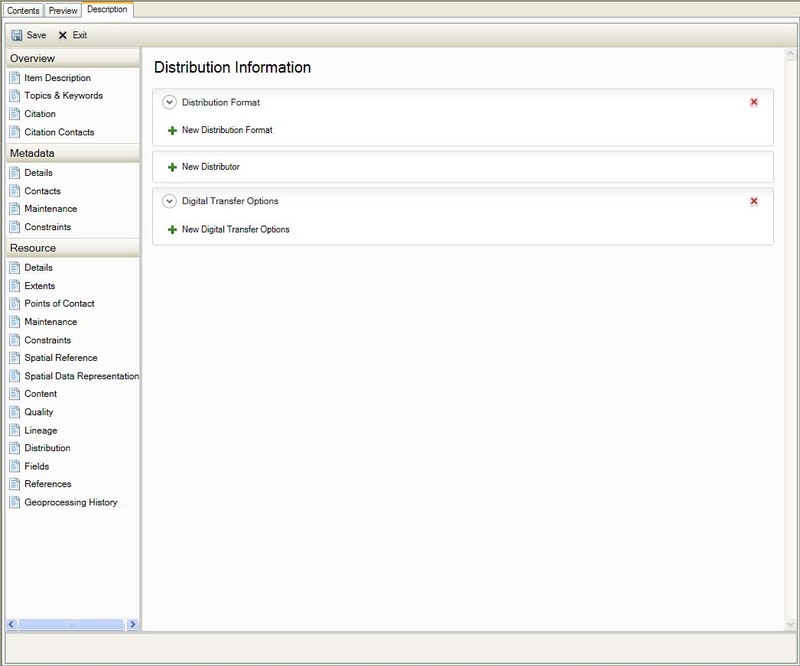 Digital Transfer Options are repeatable. 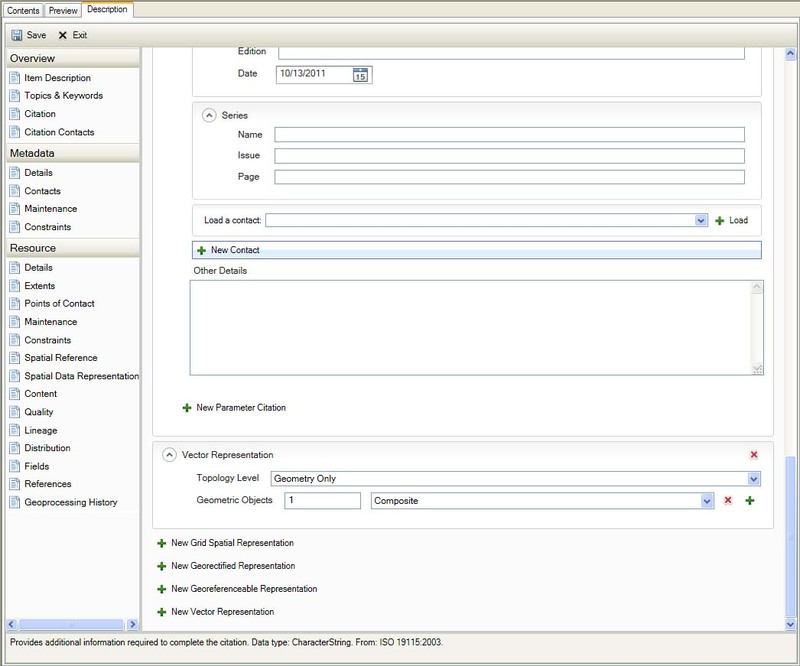 Entity and Attribute Details are repeatable. 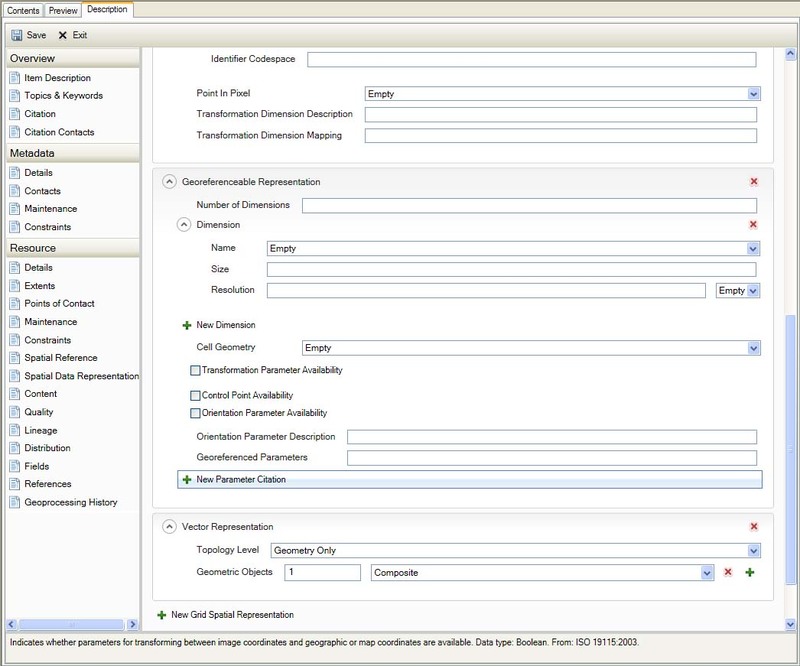 Presentation Form Dropdown is repeatable (with FGDC Geospatial Data Presentation Form). 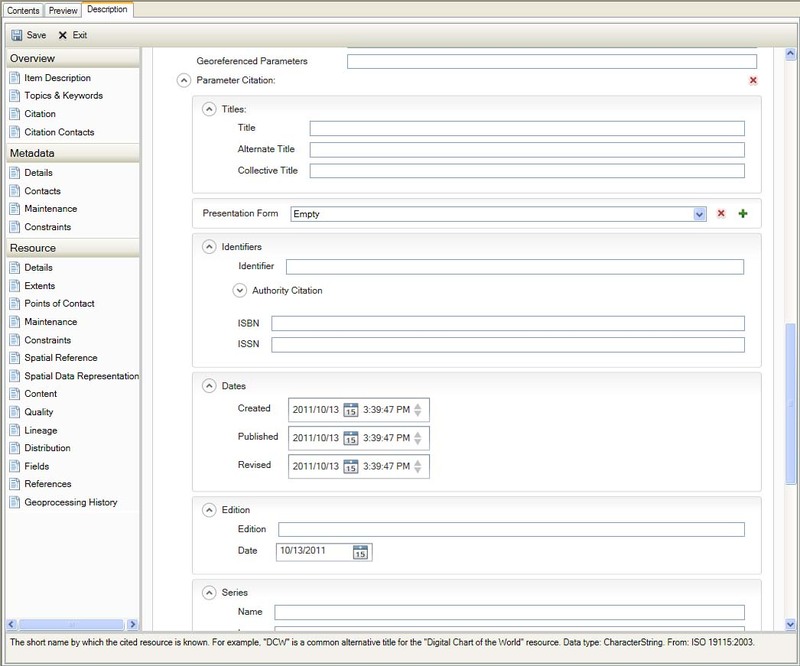 FGDC Geospatial Data Presentation Form Dropdown is repeatable (with Presentation Form). Title The name by which the cited resource is known. Data type: CharacterString. From: ISO 19115:2003. Alternate Title The short name by which the cited resource is known. For example, "DCW" is a common alternative title for the "Digital Chart of the World" resource. Data type: CharacterString. From: ISO 19115:2003. Collective Title The title of a collection or series of which this resource is a part. However, a larger work such as a collection or series can be more completely and accurately documented as an aggregate resource. Data type: CharacterString. From: ISO 19115:2003. 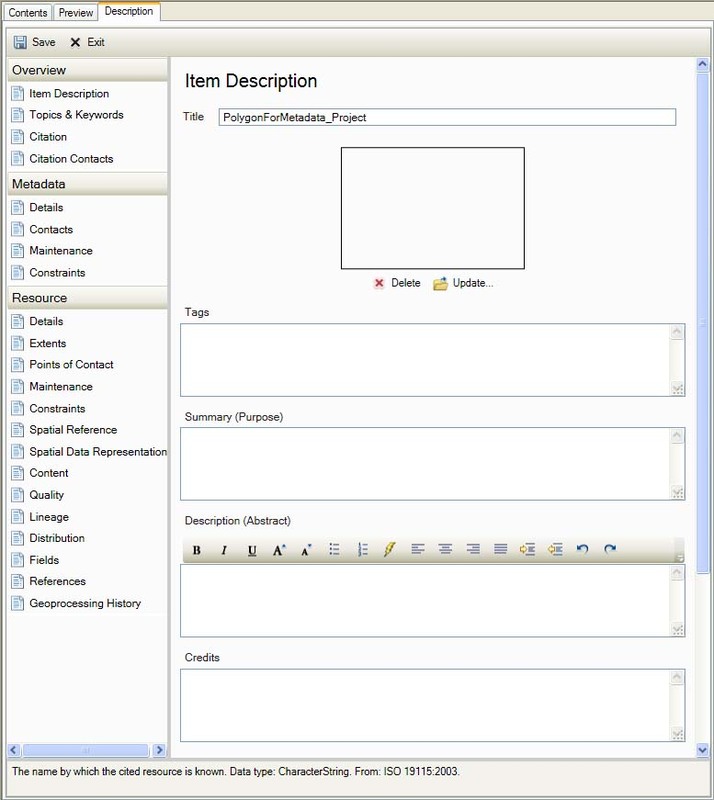 Presentation Form (Describes the manner in which the resource is represented. Data type: CI_PresentationFormCode. From: ISO 19115:2003.) 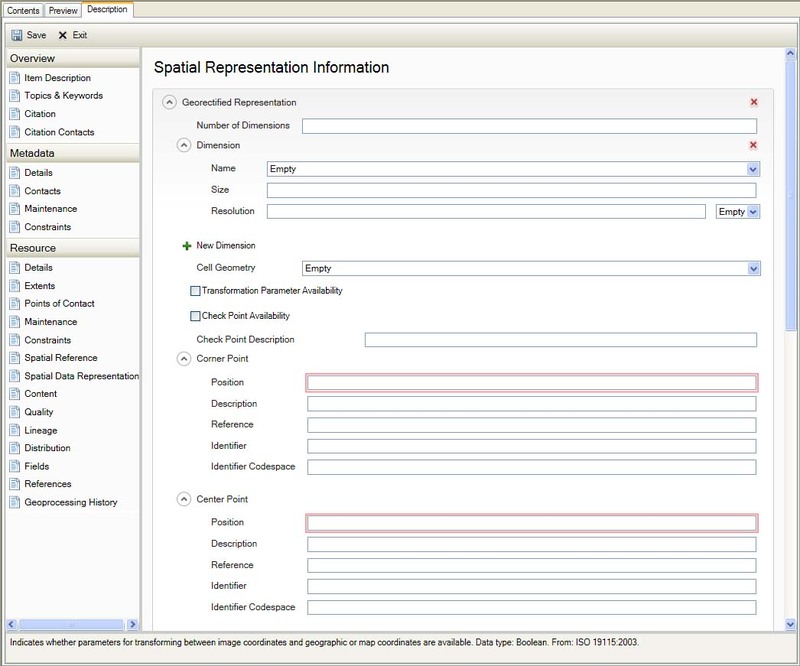 Dropdown is repeatable(with FGDC Geospatial Data Presentation Form). Identifier An alphanumeric value that identifies an authoritative reference, or an instance in a namespace. Data type: CharacterString. From: ISO 19115:2003. ISBN An international standard book number associated with the resource. Data type: CharacterString. From: ISO 19115:2003. ISSN An international standard serial number associated with the resource. Data type: CharacterString. From: ISO 19115:2003. 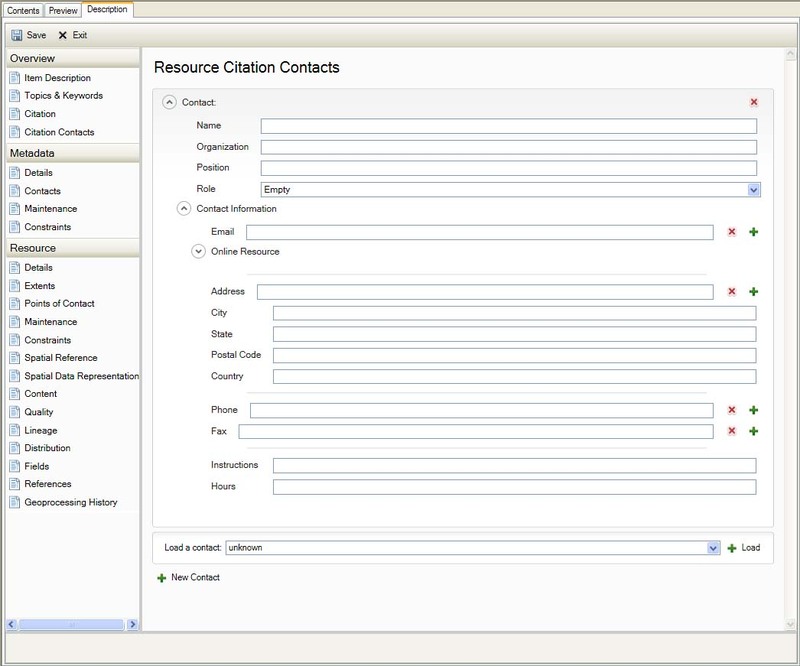 Created The date when the cited resource was created. Data type: Date. From: ISO 19115:2003. 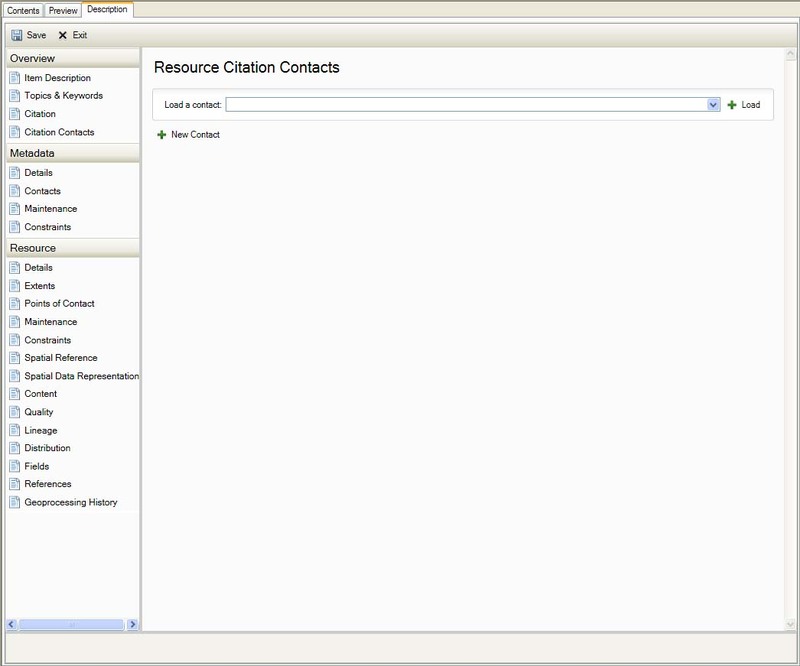 Published The date when the cited resource was published. Data type: Date. From: ISO 19115:2003. Revised The date when the cited resouce was revised. Data type: Date. From: ISO 19115:2003. Edition The version of the cited resource. Data type: CharacterString. From: ISO 19115:2003. 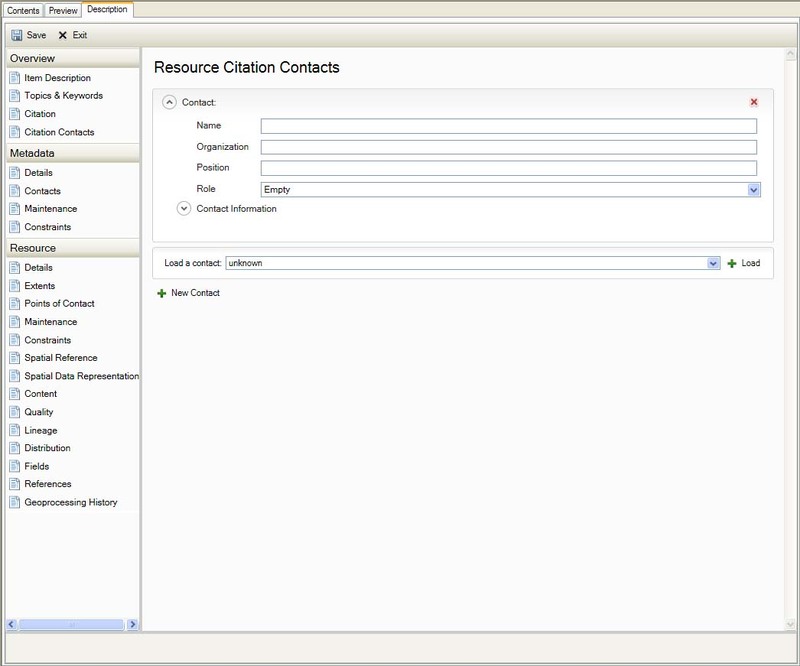 Date The date of this edition of the cited resource. Data type: Date. From: ISO 19115:2003. Name The name of the collection or series of which the resource is a part. Data type: CharacterString. From: ISO 19115:2003. Issue Identifies the issue in the series assicated with the resource. Data type: CharacterString. From: ISO 19115:2003. Page Identifies the pages of the publication on which the article was published. Data type: CharacterString. From: ISO 19115:2003. Other Details Provides additional information required to complete the citation. Data type: CharacterString. From: ISO 19115:2003. Name The name of the person associated with the resource. The name of an individual, organization, or position must be provided. Data type: CharacterString. From: ISO 19115:2003. Organization The name of an organization associated with the resource. The name of an individual, organization, or position must be provided. Data type: CharacterString. From: ISO 19115:2003. 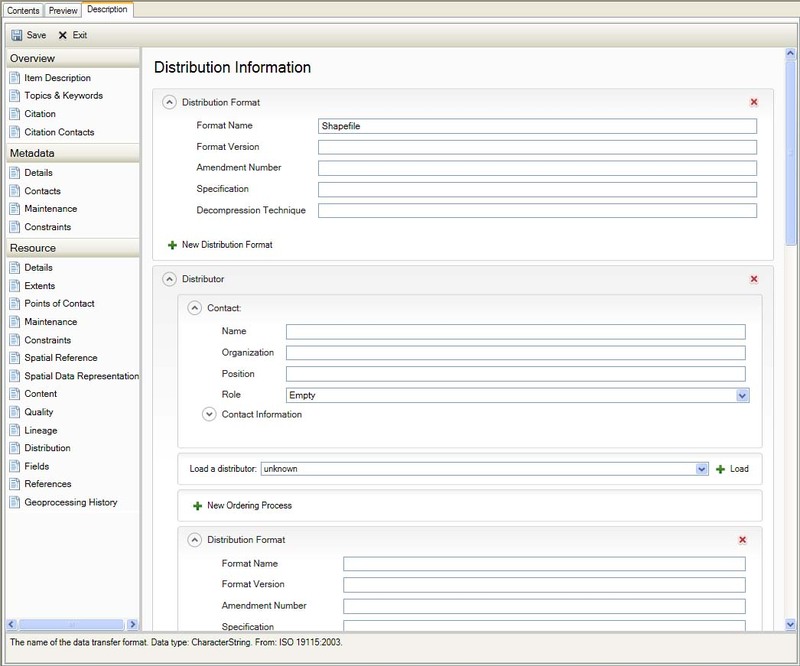 Position The name of a role or position associated with the resource. The name of an individual, organization, or position must be provided. Data type: CharacterString. From: ISO 19115:2003. Email The address of the electronic mailbox where a responsible party may be reached. Data type: CharacterString. From: ISO 19115:2003. Linkage The location or address where an online resource can be accessed using a Uniform Resource Locator or similar addressing scheme. 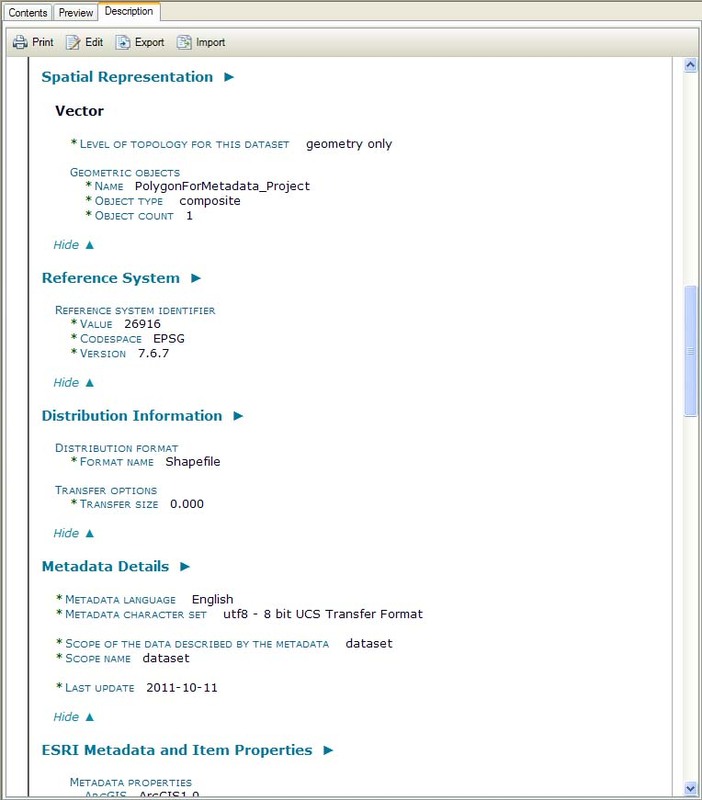 For example, information about ESRI can be found at the URL http://www.esri.com. Data type: URL. From: ISO 19115:2003. Protocol The connection protocol to be used when accessing the online resource. Data type: CharacterString. From: ISO 19115:2003. 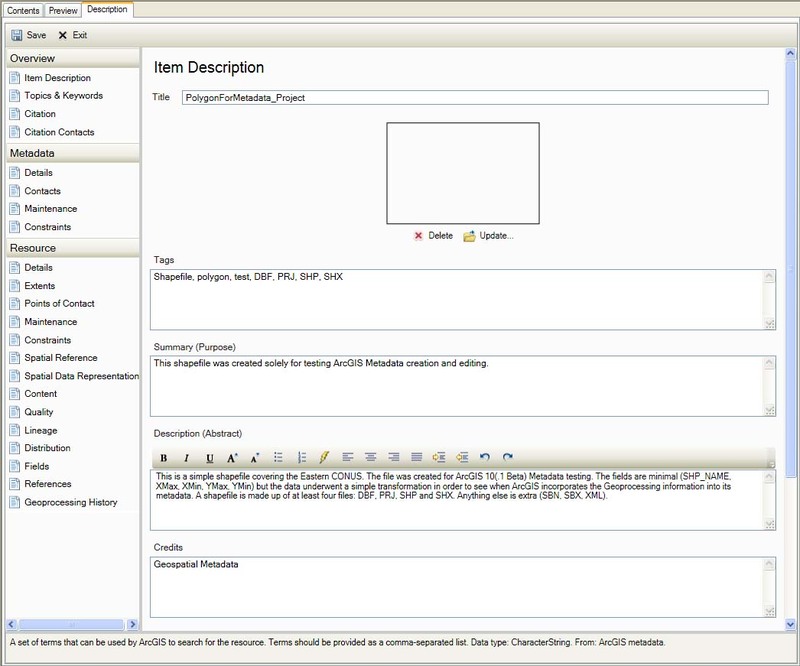 Profile The name of an application profile that can be used with the online resource. Data type: CharacterString. From: ISO 19115:2003. Name The name of the online resource. Data type: CharacterString. From: ISO 19115:2003. 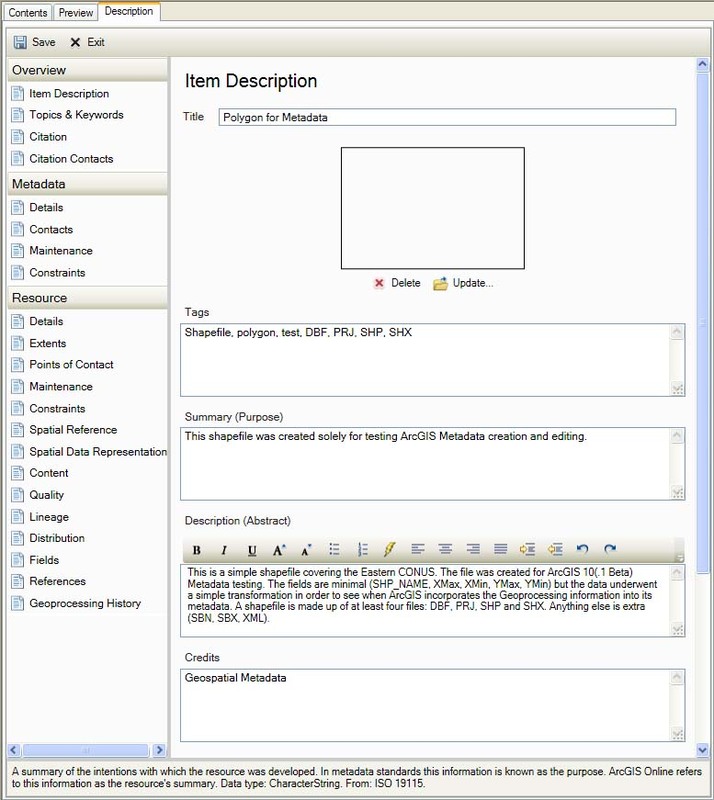 Description Describes what the online resource is or does. Data type: CharacterString. From: ISO 19115:2003. City The city of the location. Data type: CharacterString. From: ISO 19115:2003. State The state or province of the location. Data type: CharacterString. From: ISO 19115:2003. Postal Code The ZIP or postal code of the location. Data type: CharacterString. From: ISO 19115:2003. Country The country of the location. Data type: CharacterString. From: ISO 19115:2003. Instructions Provides additional instructions describing how or when to contact the responsible party. Data type: CharacterString. From: ISO 19115:2003. 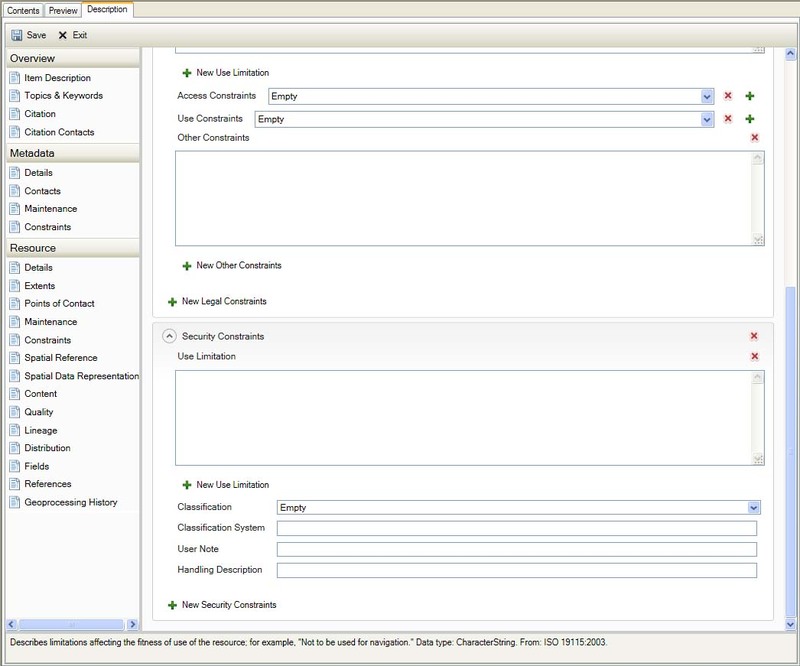 Hours Provides a timeperiod, including the time zone, when a responsible party may be contacted. Data type: CharacterString. From: ISO 19115:2003. Title The name by which the cited resource is known. Data type: Character String. From: ISO 19115:2003. Thumbnail A small graphic that illustrates the resource's content, or graphically identifies the resource in another manner. 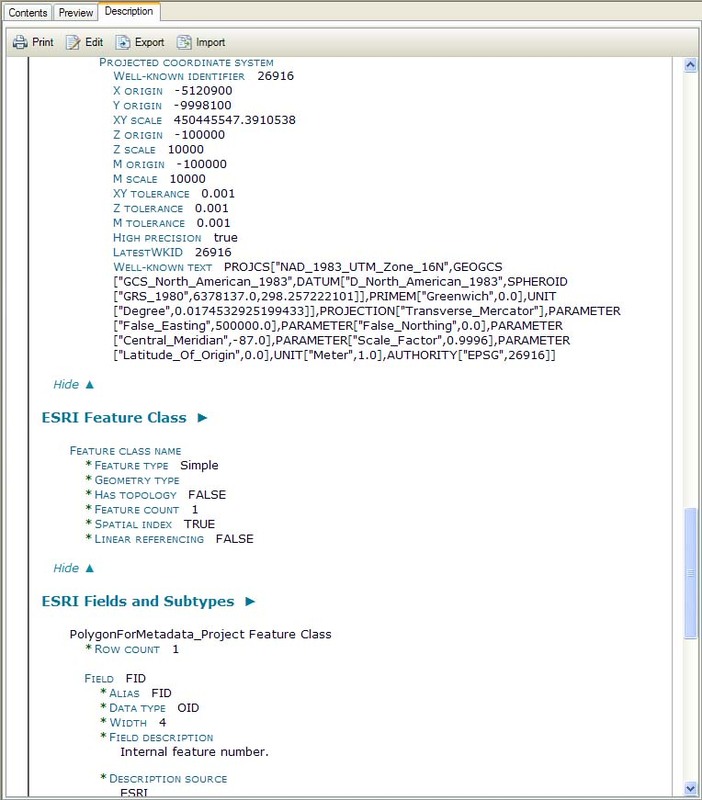 The graphic is encoded as base 64 text and embedded within the item's metadata. Thumbnails can be created when previewing the resource in the Item Description dialog box or in ArcCatalog. 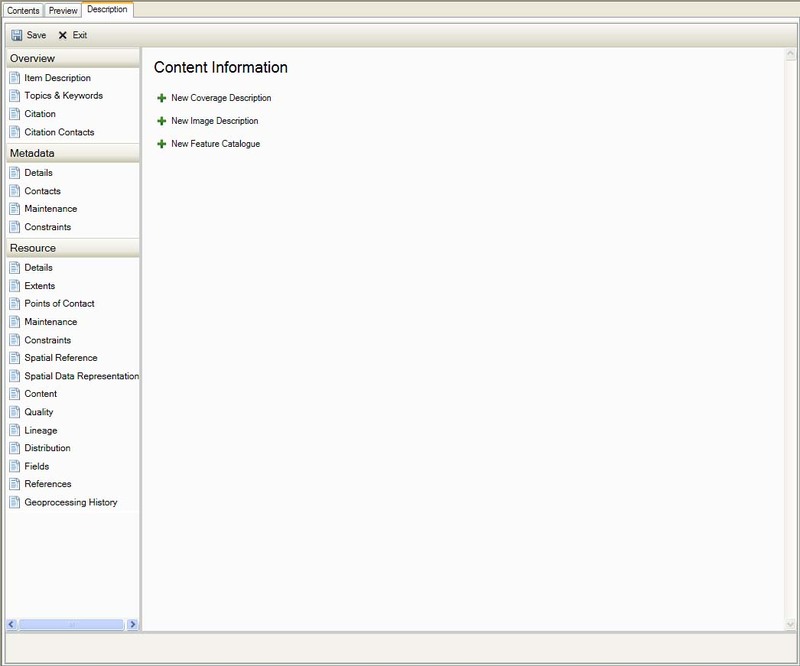 For items that can't be previewed, an external file can be included in the item's metadata and used as its thumbnail. 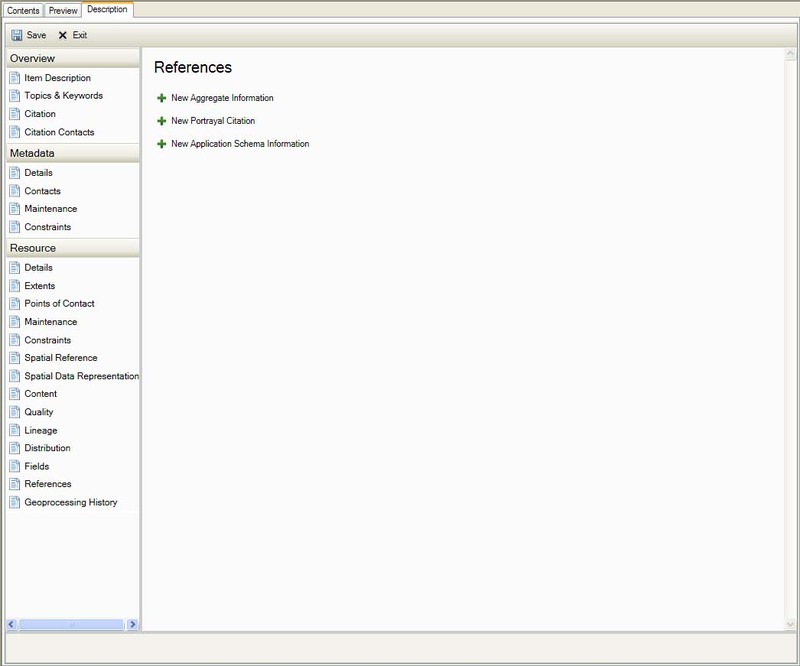 In contrast, a resource's graphic overview is an external file that is referenced by the item's metadata. External files can be longer and more detailed. 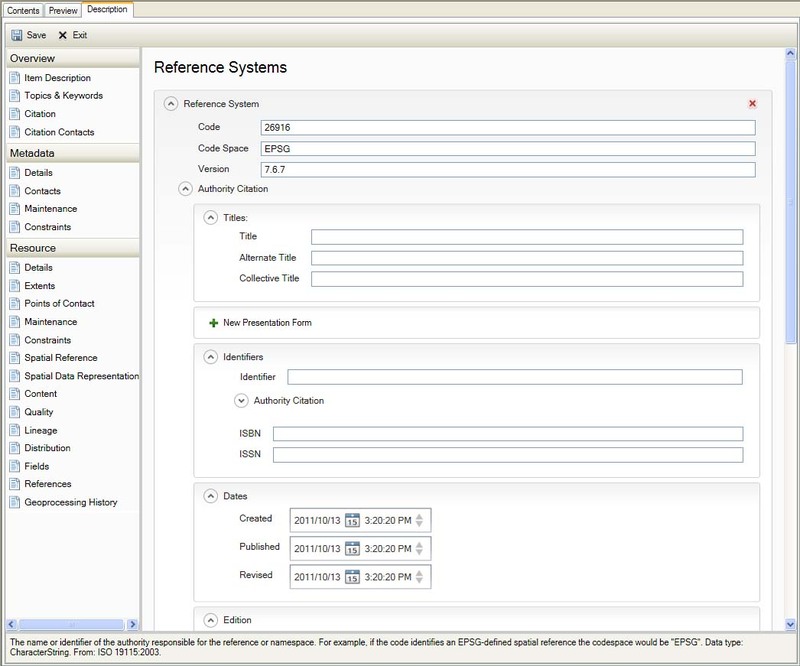 If an extrenal file is moved the location of that file stored in the resources metadata will be invalid. Data type: CharacterString. 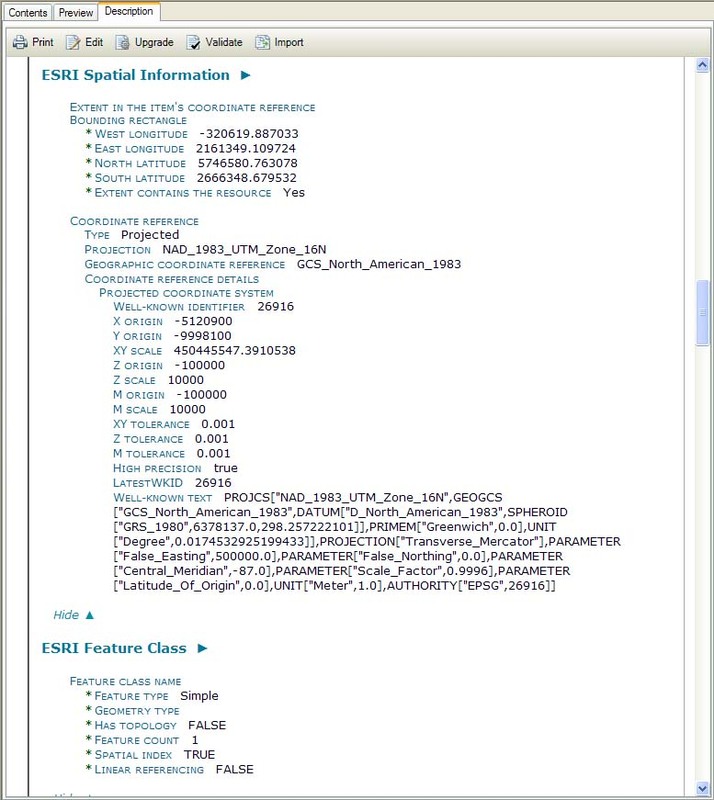 From: ArcGIS metadata. 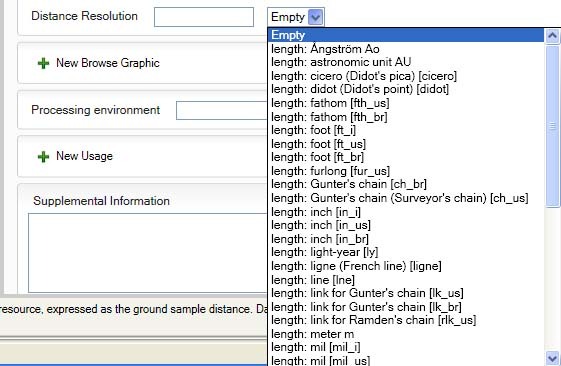 Tags A set of terms that can be used by ArcGIS to search for the resource. Terms should be provided as a comma-separated list. Data type: CharacterString. 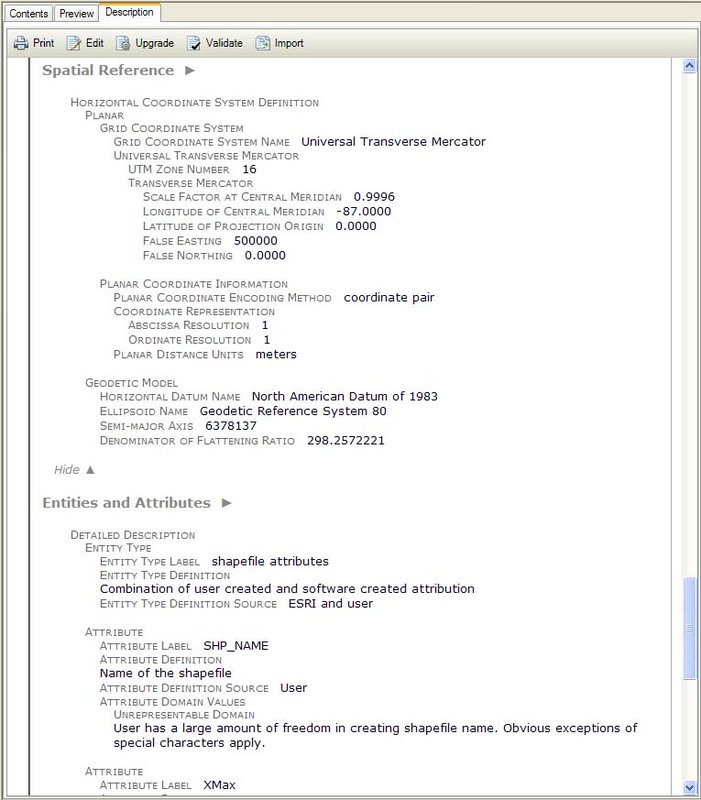 From: ArcGIS metadata. Summary (Purpose) A summary of the intentions with which the resource was developed. In metadata standards this information is known as the purpose. 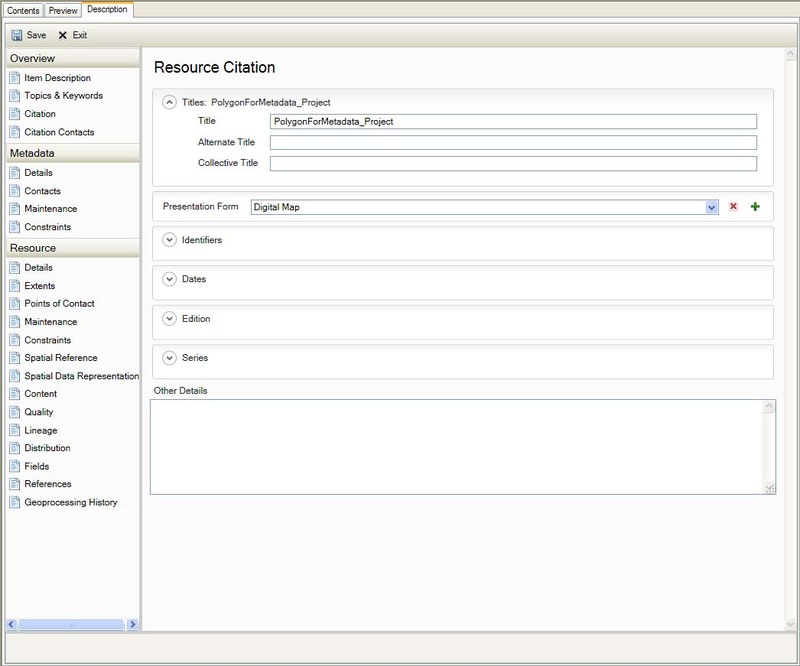 ArcGIS Online referes to this information as the resource's summary. Data type: CharacterString. From: ISO19115. Description (Abstract) A brief narrative summary of the resource's content. In metadata standards this information is known as the abstract. 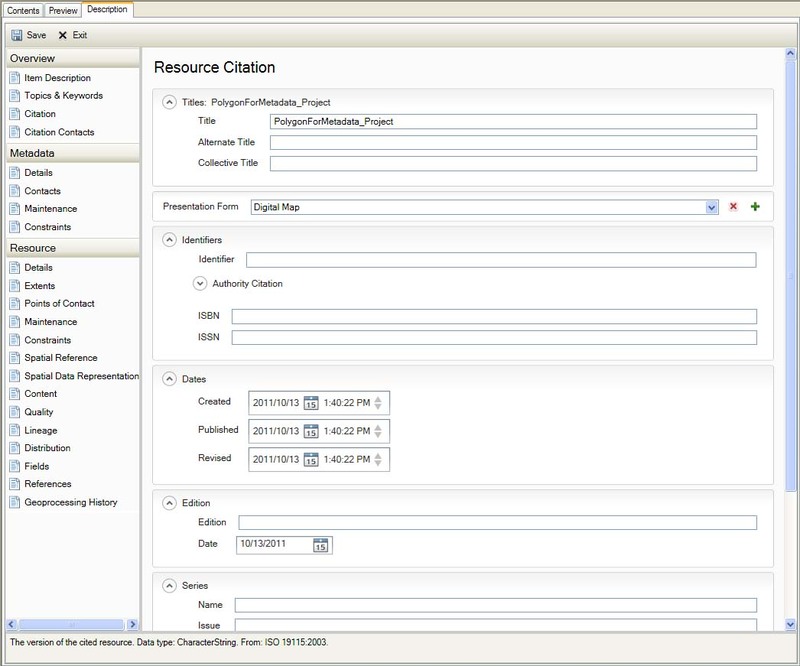 ArcGIS Online refers to this information as the resource's description. 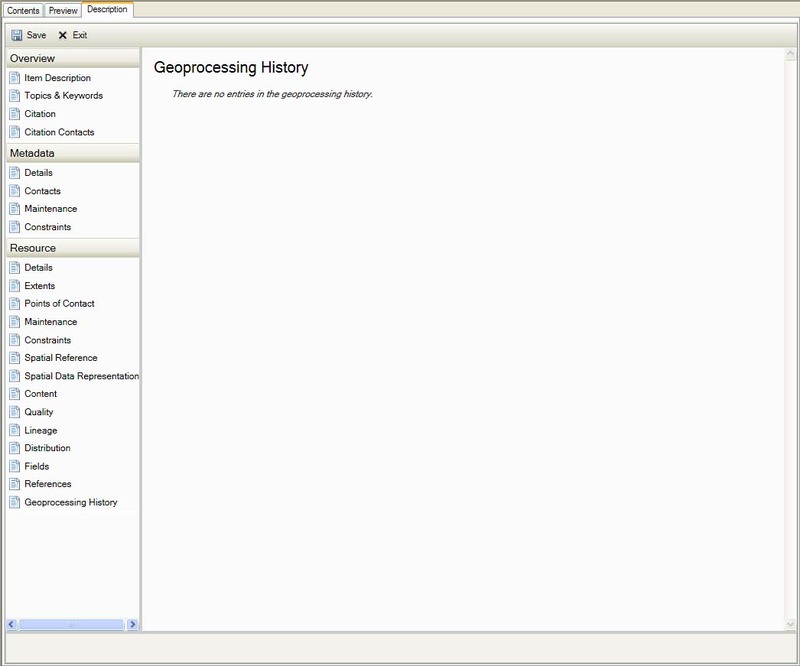 For geoprocessing tools this information is referred to as the tool's summary. Data type: CharacterString. From: ISO 19115. Credits A recognition of those who created or contributed to the resource. Data type: CharacterString. From: ISO 19115. Use Limitation A recognition of those who created or contributed to the resource. Data type: CharacterString. From: ISO 19115. 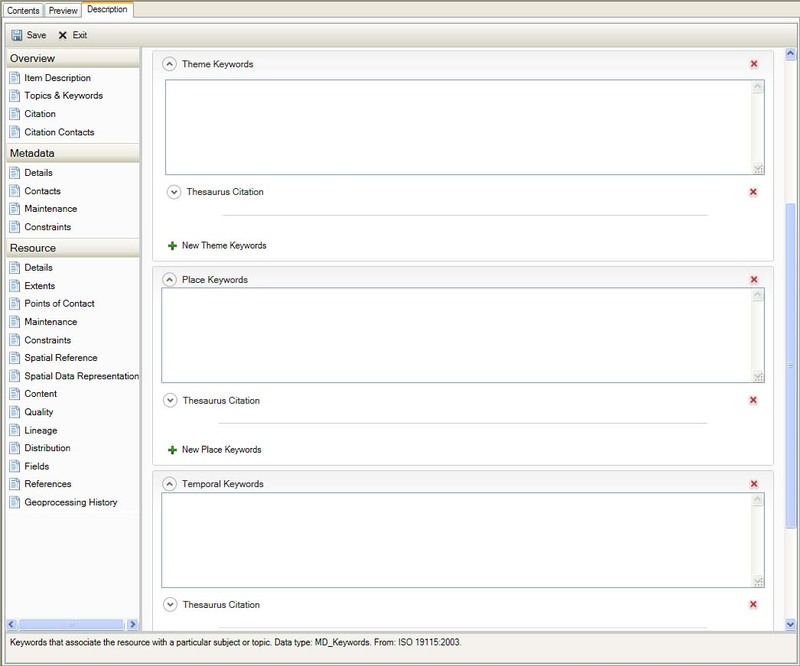 Theme Keywords are repeatable. 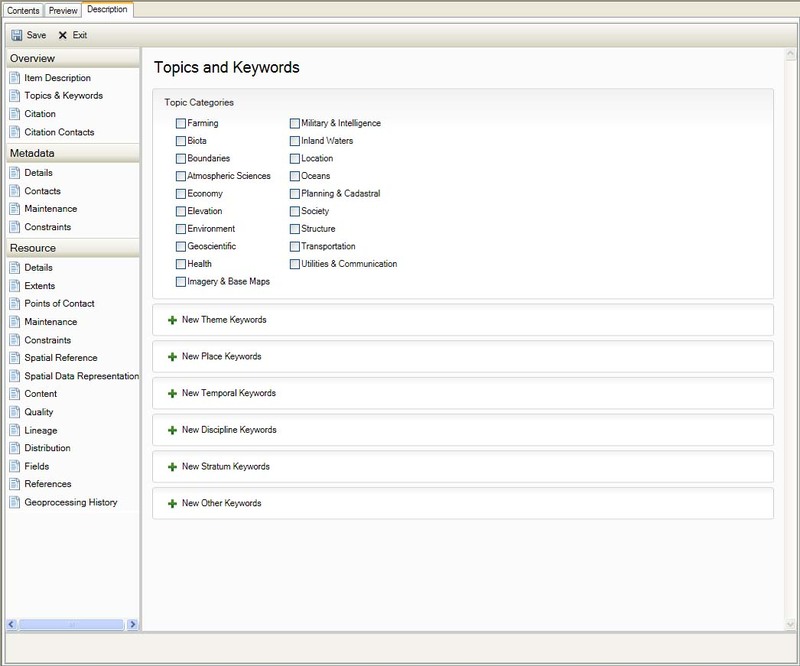 Keywords that associate the resource with a particular subject or topic. Data type: MD_Keywords. From: ISO 19115:2003. Place Keywords are repeatable. Keywords that associate the resource with a location. Data type: MD_Keywords. From: ISO 19115:2003. Temporal Keywords are repeatable. Keywords that associate the resource with a timeperiod. Data type: MD_Keywords. From: ISO 19115:2003. Discipline Keywords are repeatable. Keywords that associate the resource with a branch of instruction or specialized learning. Data type: MD_Keywords. From: ISO 19115:2003. Stratum Keywords are repeatable. Keywords that associate the resource with a layer or leve, for example, in the soil, sea, or atmosphere. Data type: MD_Keywords. From: ISO 19115:2003. Other Keywords are repeatable. Keywords that don't fit into other categories that describe characteristics of the resource. Data type: MD_Keywords. From: ISO 19115:2003. File Identifier A unique identifier for the metadata. 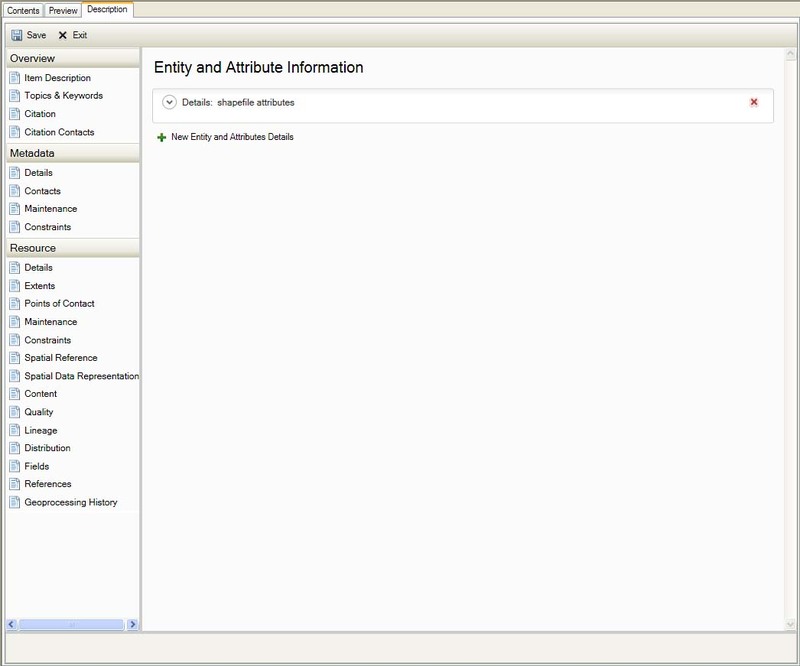 An identifer generated by ArcGIS is typically a Globally Unique Identifier (GUID). Data type: CharacterString. From: ISO 19115:2003. Parent Identifier Unique identifier of the "parent" metadata to which tis metadata is a subset, or "child". 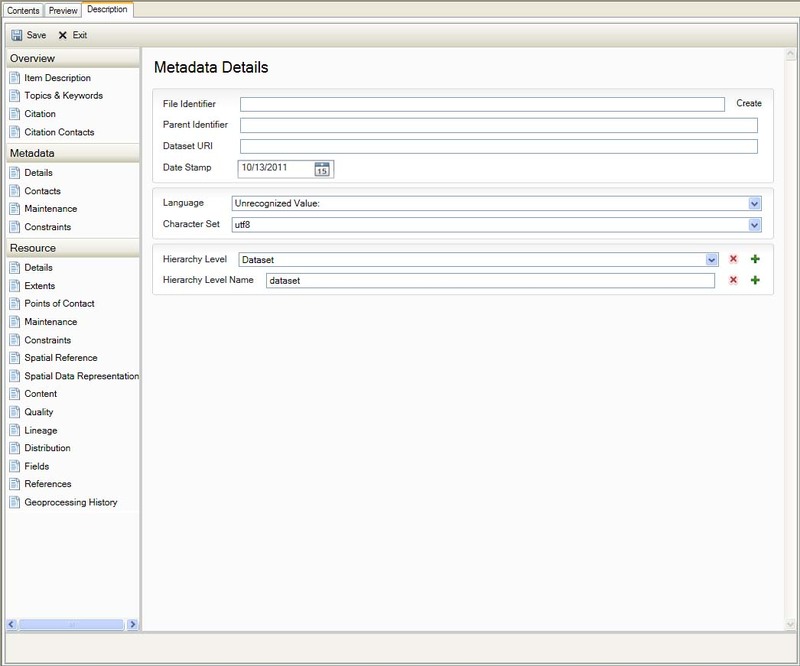 For example: if the metadata describes a resource that is part of a series, the parent metadata would describe the series as a whole. This information is required if there is an upper hierarchy level resource of which this resource is a part. Data type: CharacterString. From: ISO 19115:2003/Cor. 1:2006. 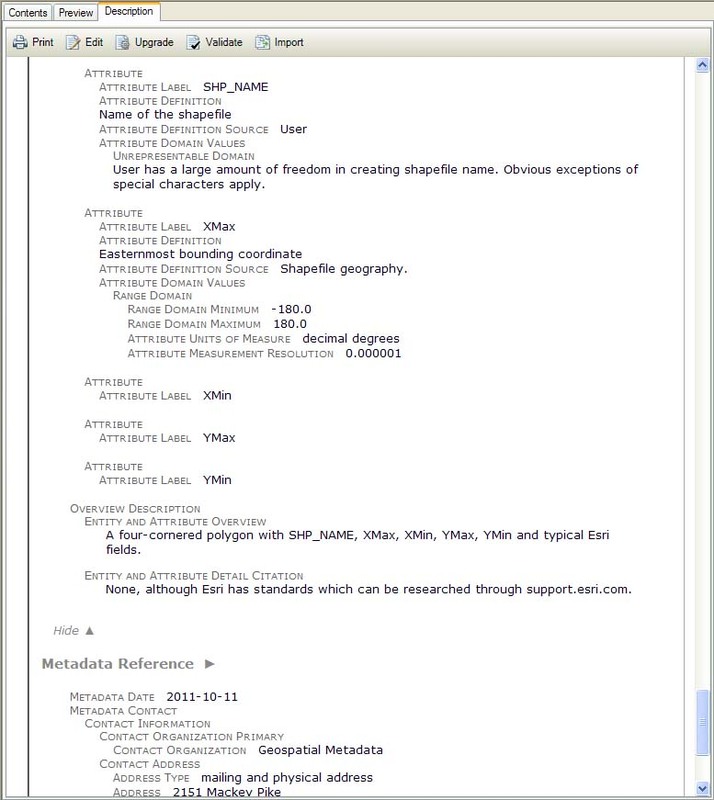 Dataset URI The Uniform Resource Identifier (URI) of the resource described by the metadata. Data type: CharacterString. From: ISO 19115:2003. Date stamp The date when the metadata was created or updated. Data type: Date. From: ISO 19115:2003. Hierarhcy Level Name The name of the hierarchy level for which the metadata is provided. 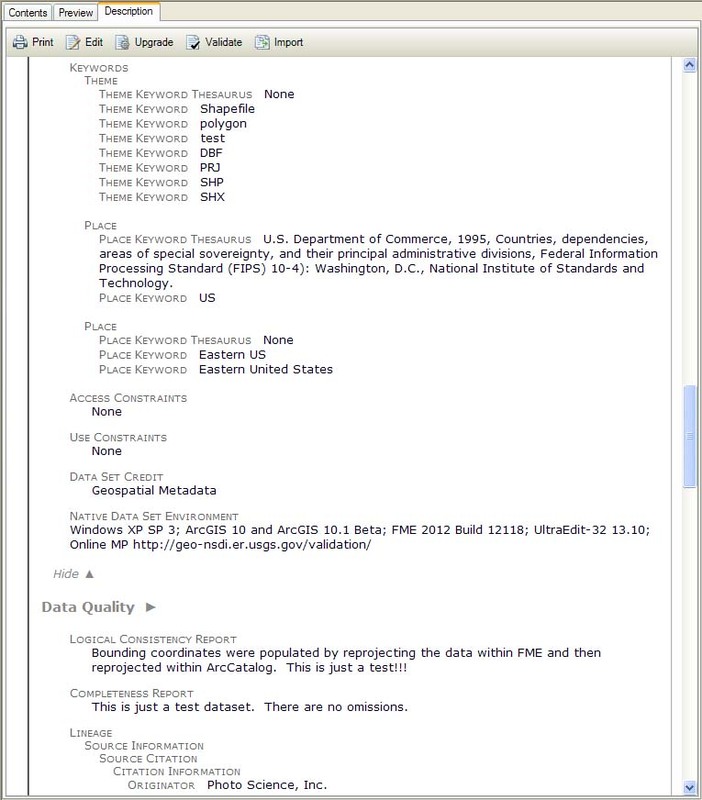 This information is required if the resource's hierarchy level is a level other than "dataset". Data type: CharacterString. From: ISO19115:2003. 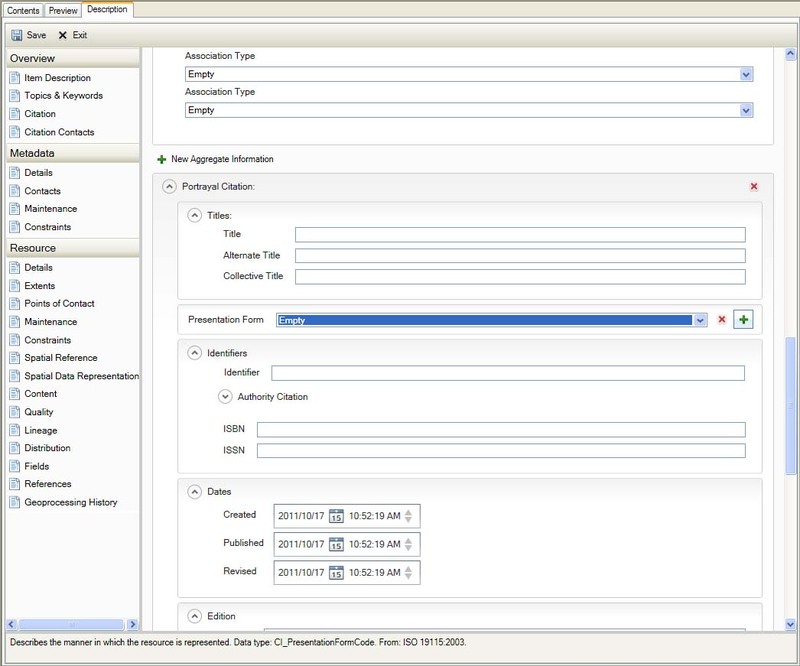 Custom Frequency Describes a custom maintenance period as the duration of time between updates. Durations are formatted as PnYnMnDTnHnMnS, where the length of time isnY years, nM months, nD days, nH hours, nM minutes, nS seconds. The period designator, "P", must be provided. The date/time separator, "T" must be present when units of time are given and must be absent when units of time are omitted. Units in the duration that are zero can be omitted. At least one number and its designator must be provided. Seconds may have a decimal fraction. For example, a period of 45 days would be P45D. Data type: TM_PeriodDuration. From: ISO 19115:2003. Next Update The scheduled revision date. Data type: Date. From: ISO 19115:2003. 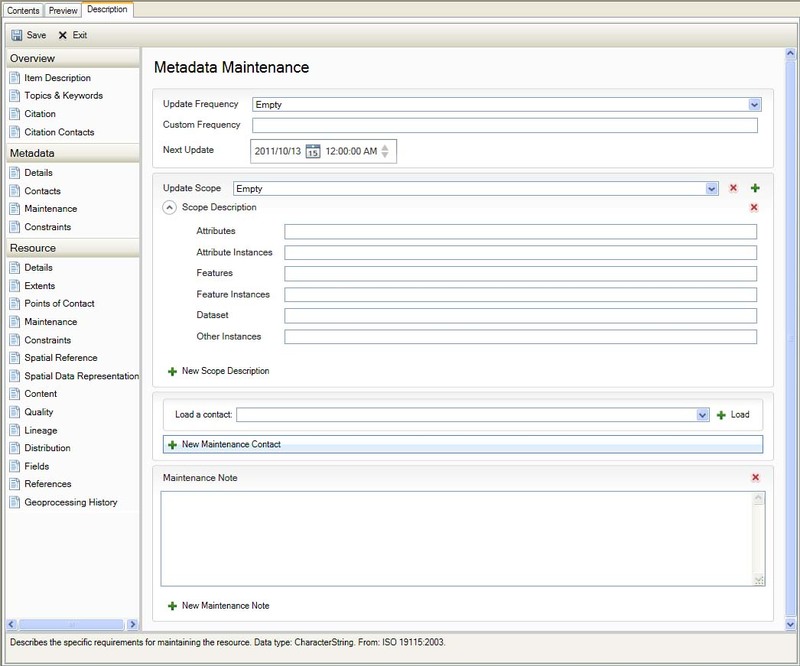 Update Scope (The scope of data for which this maintenance information applies. Data type: MD_ScopeCode. From: ISO 19115:2003.) 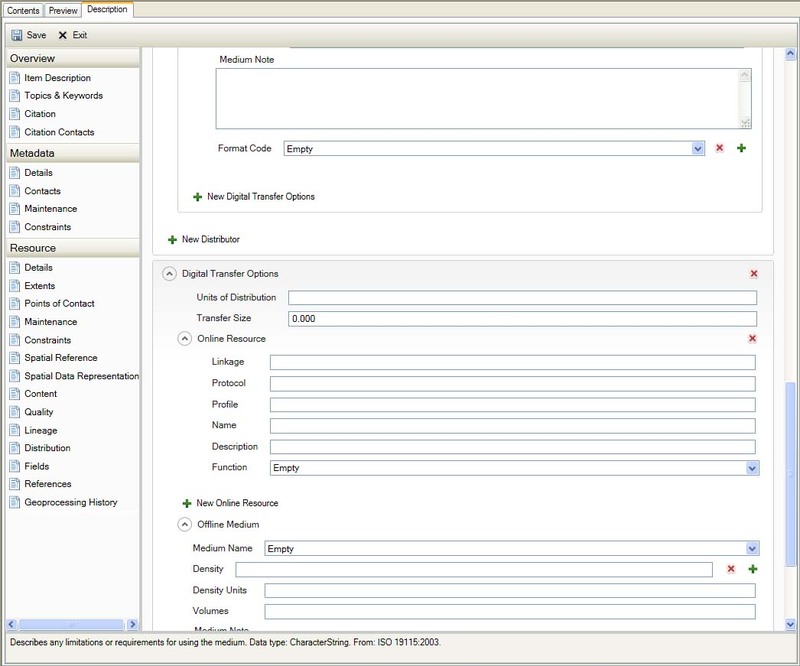 Dropdown is repeatable. 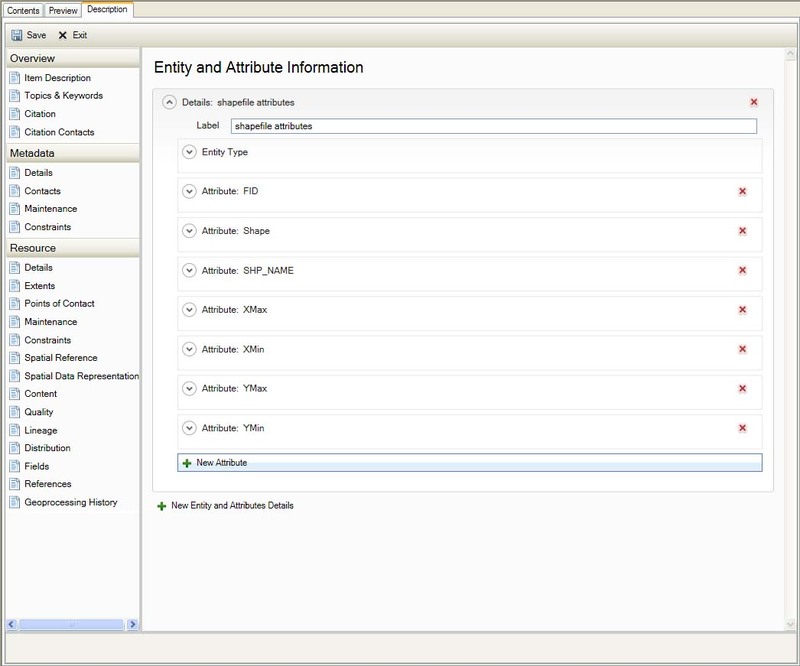 Attributes Identifies the instances of attribute types to which the information applies. Data type: GF_AttributeType. From: ISO 19115:2003/Cor. 1:2006. 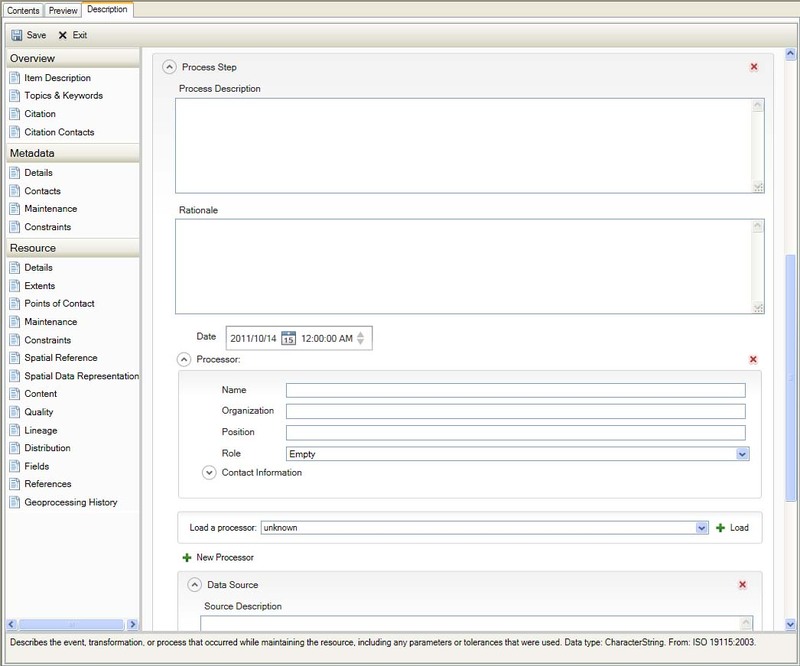 Attribute Instances Identifies the attribute instances to which the information applies. Data type: GF_AttributeType. From: ISO 19115:2003. 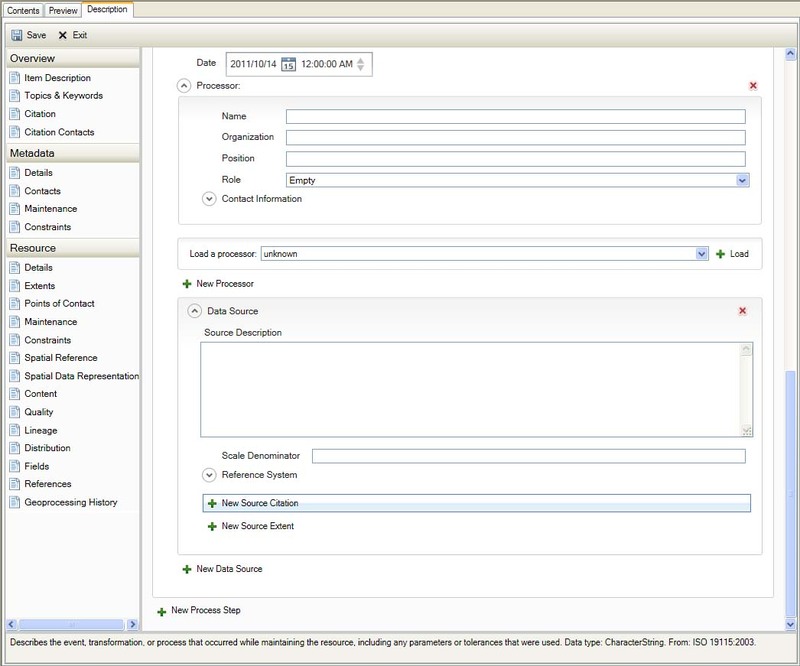 Features Identifies instances of feature types to which the information applies. Data type: GF_AttributeType. From: ISO 19115:2003/Cor. 1:2006. 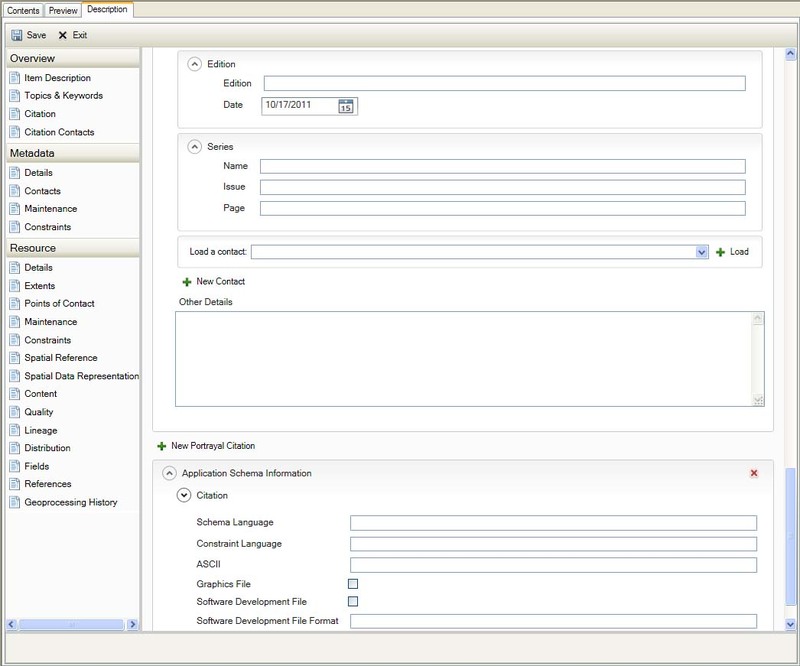 Feature Instances Identifies the feature instances to which the information applies. Data type: GF_AttributeType. From: ISO 19115:2003. 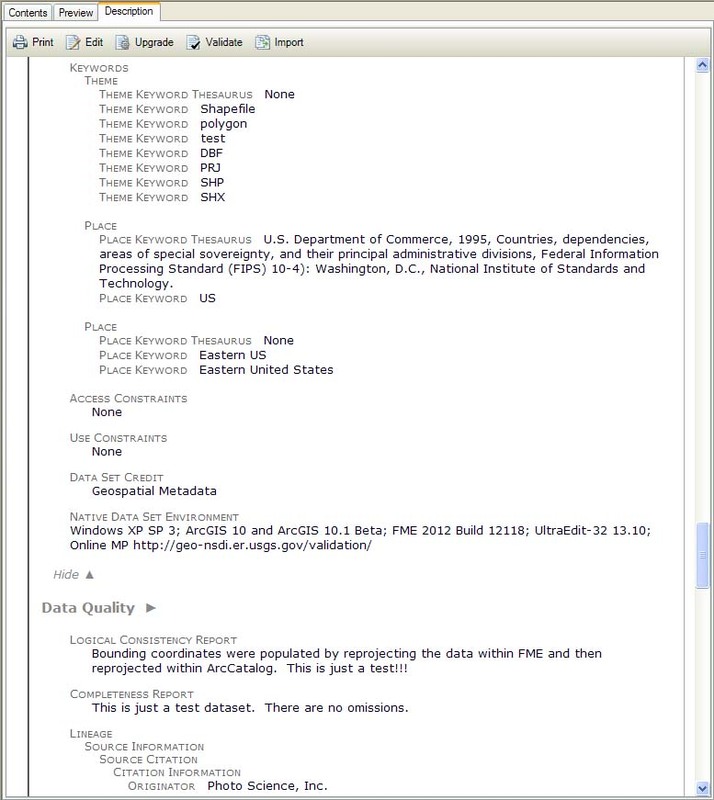 Dataset Identifies the dataset to which the information applies. Data type: CharacterString. From: ISO 19115:2003. Other Instances Identifies another class of information to which the information applies. Data type: CharacterString. From: ISO 19115:2003. Maintenance Note is repeatable. 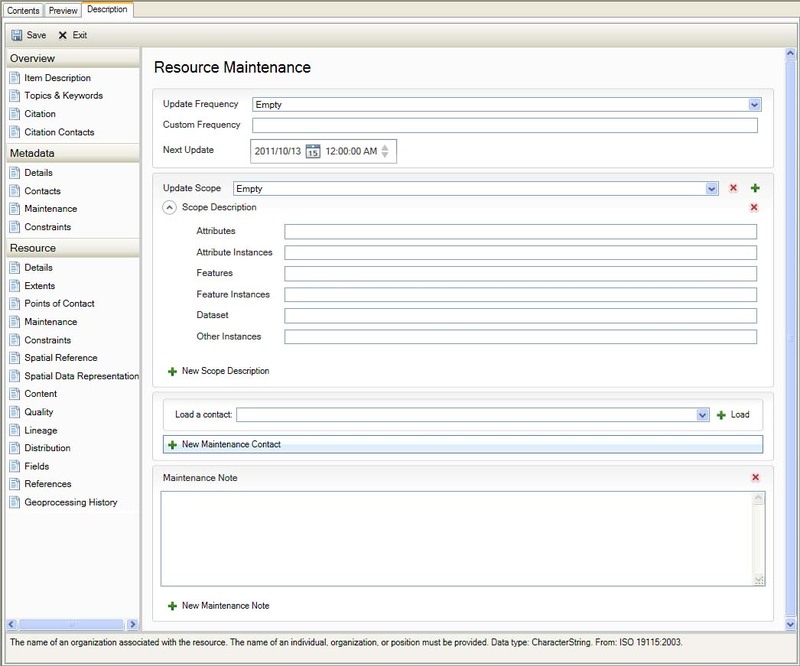 Describes the specific requirements for maintaining the resource. Data type: CharacterString. From: ISO 19115:2003. Use Limitation is repeatable. Describes limitations affecting the fitness of use of the resource; for example, "Not to be used for navigation." Datatype: CharacterString. From: ISO19115:2003. Other Constraints is repeatable. 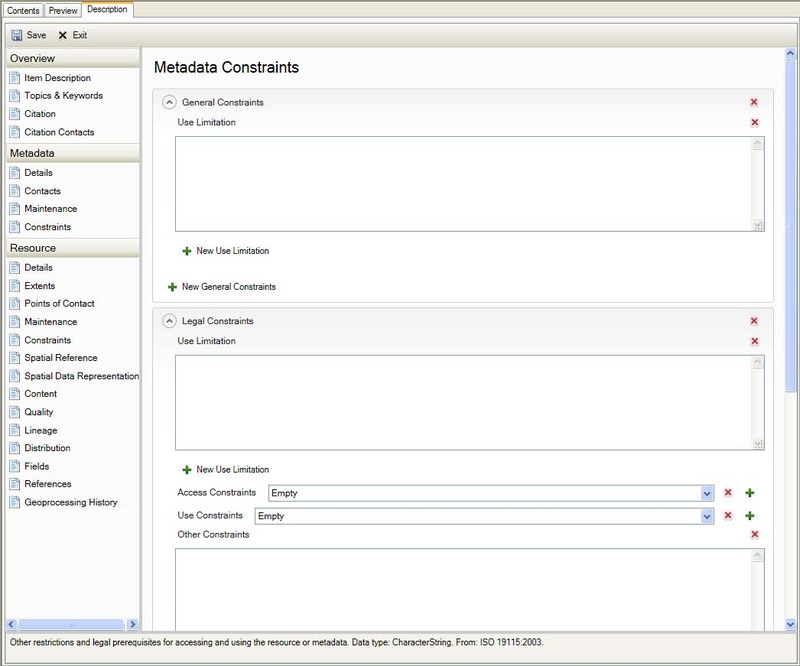 Other restrictions and legal prerequisites for accessing and using the resource or metadata. Data type: CharacterString. From: ISO 19115:2003. Use Limitation (Describes limitations affecting the fitness of use of the resource; for example, "Not to be used for navigation." Datatype: CharacterString. From: ISO19115:2003.) is repeatable. Classification system: The name of the classification system. Data type: CharacterString. From: ISO 19115:2003. User Note: Explains any legal or other restrictions and prerequisites for obtaining and using the resource or metadata. Data type: CharacterString. From: ISO 19115:2003. 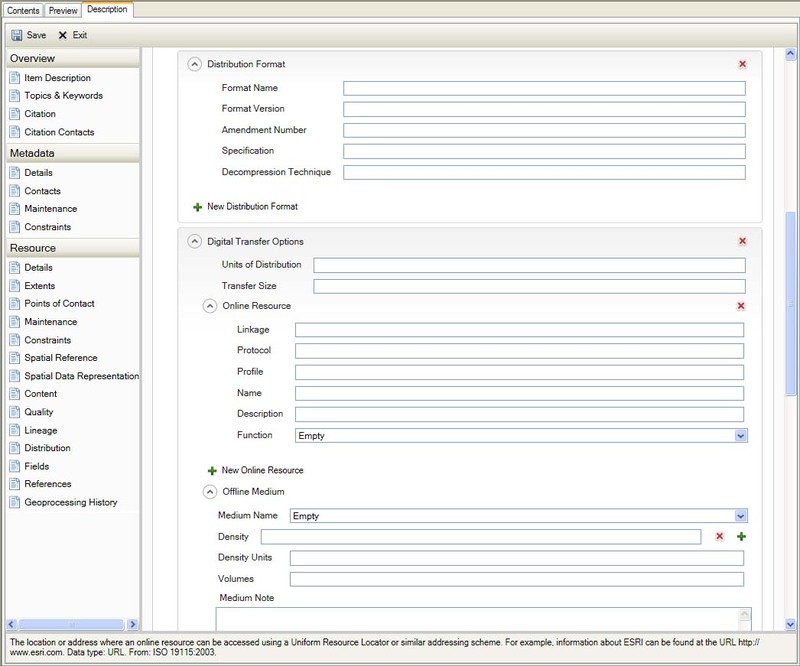 Handling Description: Provides additional information about the restrictions on handling the resource or metadata. Data type: CharacterString. From: ISO 19115:2003. Status (The status of the resource. Data type: MD_ProgressCode. From: ISO 19115.) 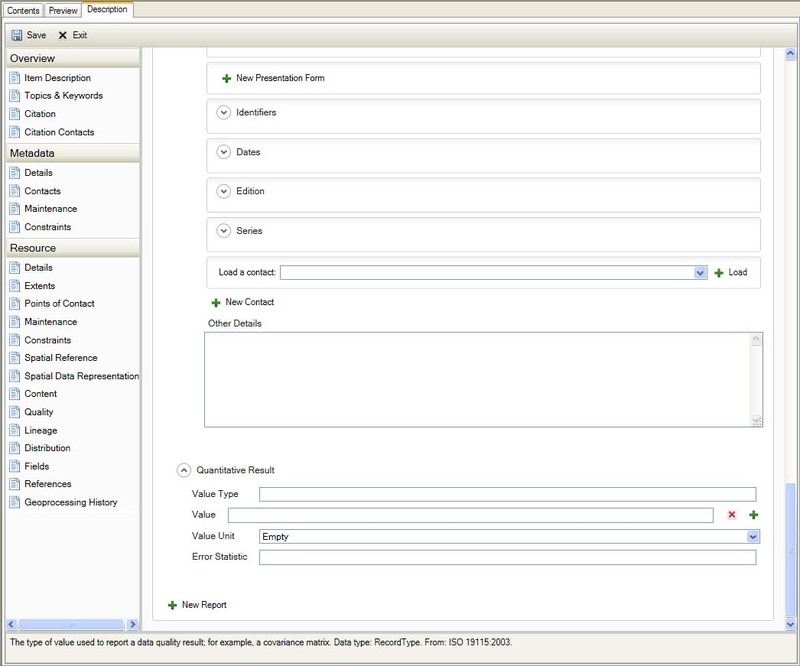 Dropdown is repeatable. Credit is repeatable. The status of the resource. Data type: MD_ProgressCode. From: ISO 19115:2003. Language (The language of information within the data. Data type: CharacterString based on ISO 630 language code. From: ISO 19115:2003.) Dropdown is repeatabe. Character Set (The character encoding standard used for the data. This information is required if the resource does not use Unicode data. Data type: MD_CharacterSetCode. From: ISO 19115:2003.) Dropdown. 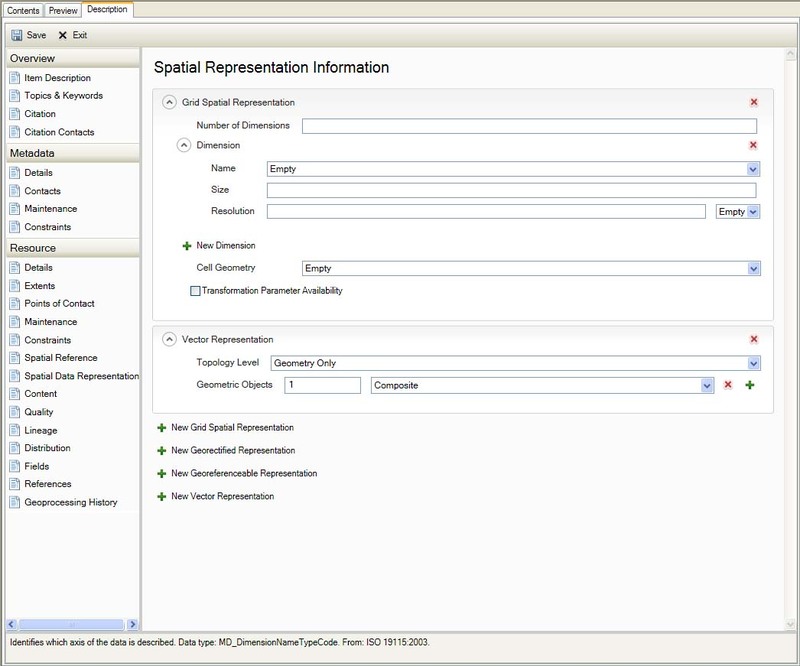 Spatial Representation Type (Identifies the method used to spatially represent geographic information. Data type: MD_SpatialRepresentationTypeCode. From: ISO 19115:2003.) 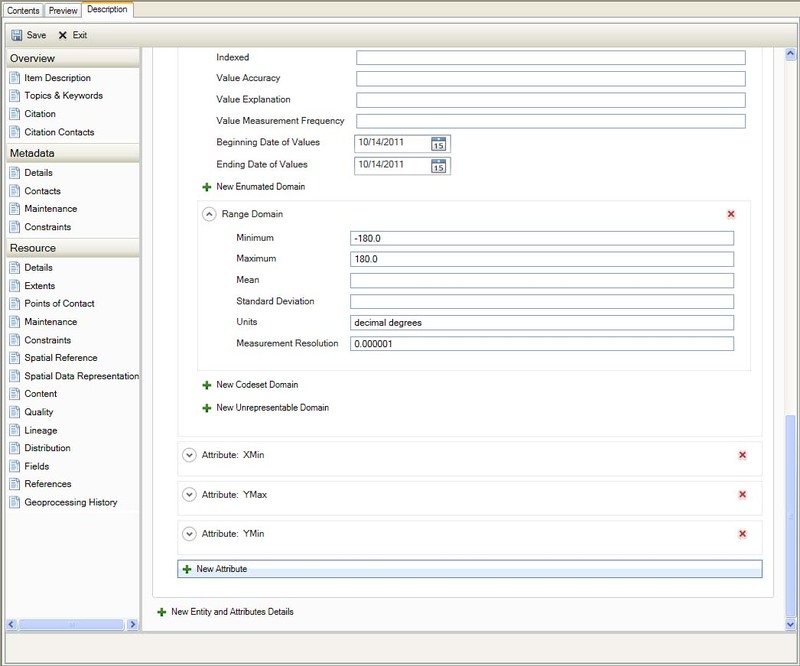 Dropdown is repeatable. Scale Resolution is repeatable. The level of detail provided by the resource, expressed as the scale of a comparable hardcopy map or chart. Data type: MD_RepresentativeFraction. From: ISO 19115:2003. Distance Resolution is repeatable. The level of detail provided by the resource, expressed as the ground sample distance. Data type: Distance. From: ISO 19115:2003. File name The file name of the graphic that provies an illustration of the resource. 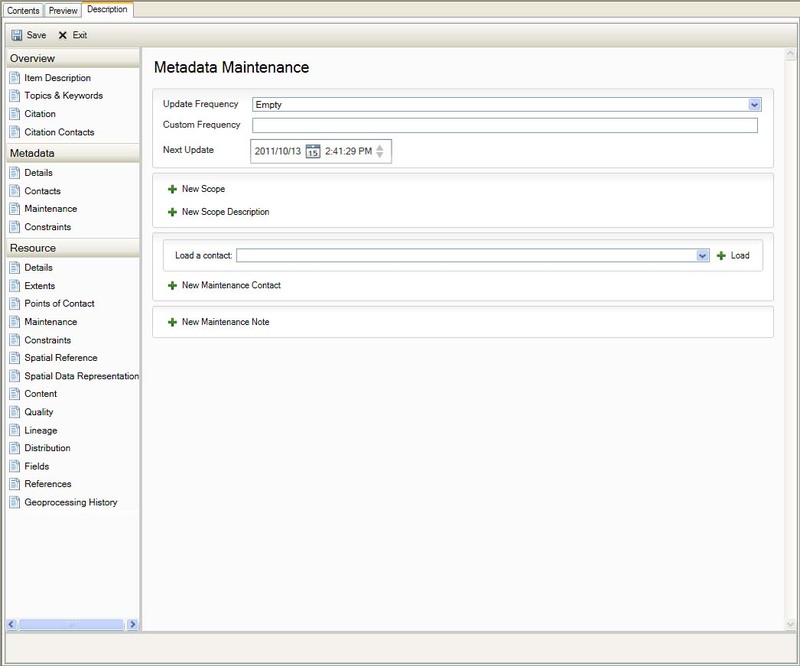 If an external file is moved, the location of that file stored in the resource's metadata will be invald. 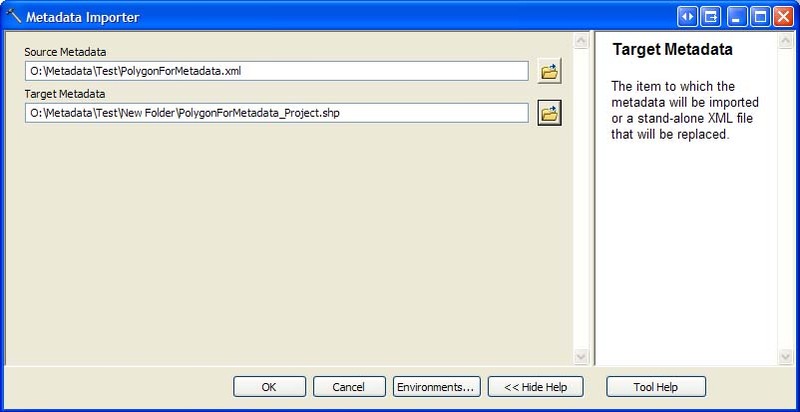 If the resources metadata will be published to a metadata catalog or geoportal the file's location should be provided as a URL or a similar type of online address. Data type: CharacterString. From: ISO 19115:2003. Description A description of the illustration. Data type: CharacterString. From: ISO 19115:2003. File type The format in which the illustration is encoded; for example, CGM, EPS, GIF, JPEG, TIFF, and so on. Data type: CharacterString. From: ISO 19115:2003. 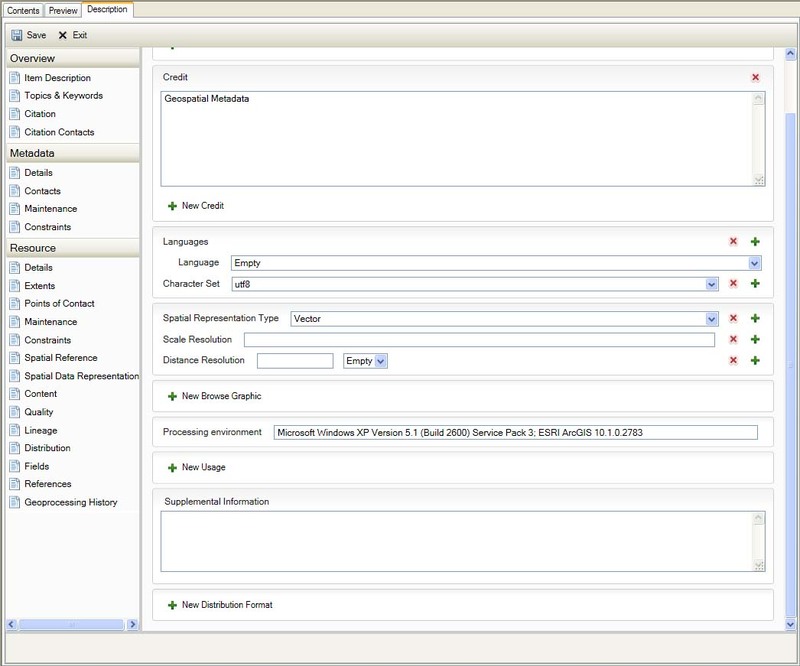 Processing Environment Describes the data's processing environment, including the software and operating system used, and the file name and size. Data type: CharacterString. From: ISO 19115:2003. 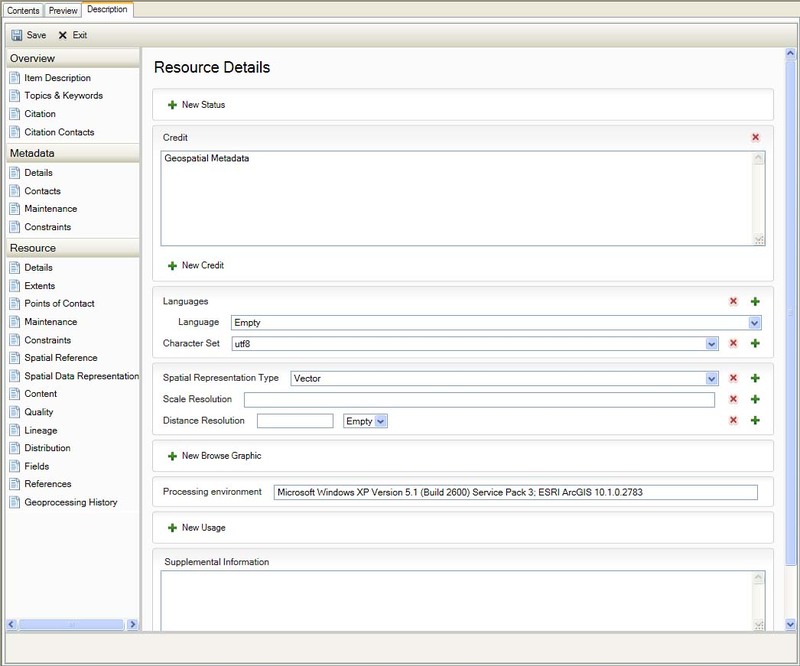 Specific Usage A brief description of how hte resource was used. Data type: CharacterString. From: ISO 19115:2003. Usage date The date and time when the resource was used. Data type: DateTime. From: ISO 19115:2003. 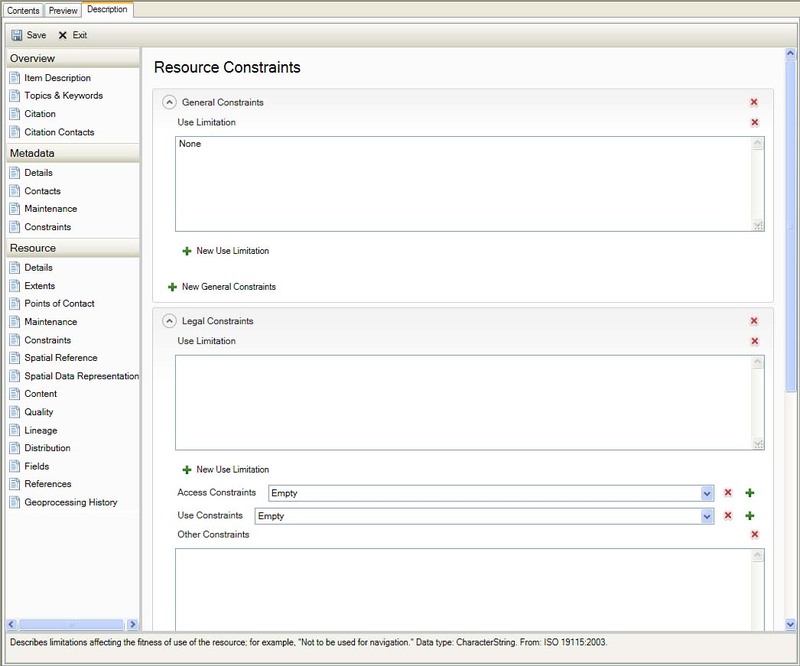 Limitations Describes applications determined by the user for which the resource is not suitable. Data type: CharacterString. From: ISO 19115:2003. 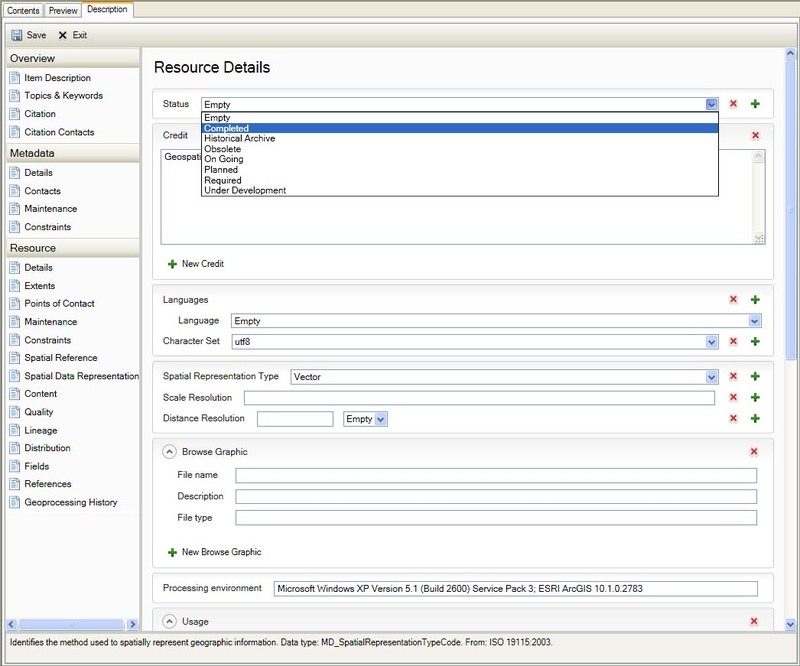 Supplemental Information Provides additional descriptive information about the resource. Data type: CharacterString. From: ISO 19115:2003. Format Name The name of the data transfer format. Data type: CharacterString. From: ISO 19115:2003. 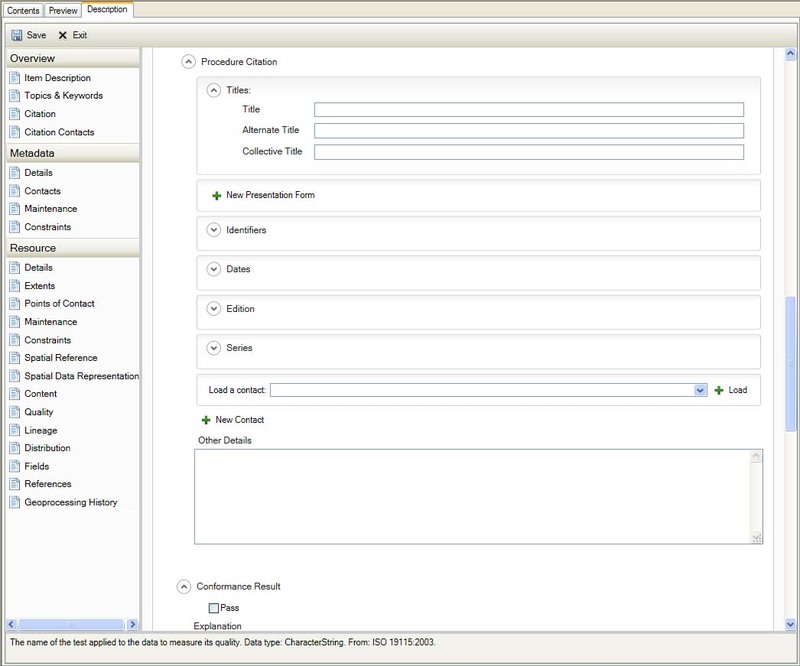 Format Version The version of the transfer format, if appropriate; for example, a data or number. Data type: CharacterString. From: ISO 19115:2003. Amendment Number A amendment number for this version of the format. Data type: CharacterString. From: ISO 19115:2003. 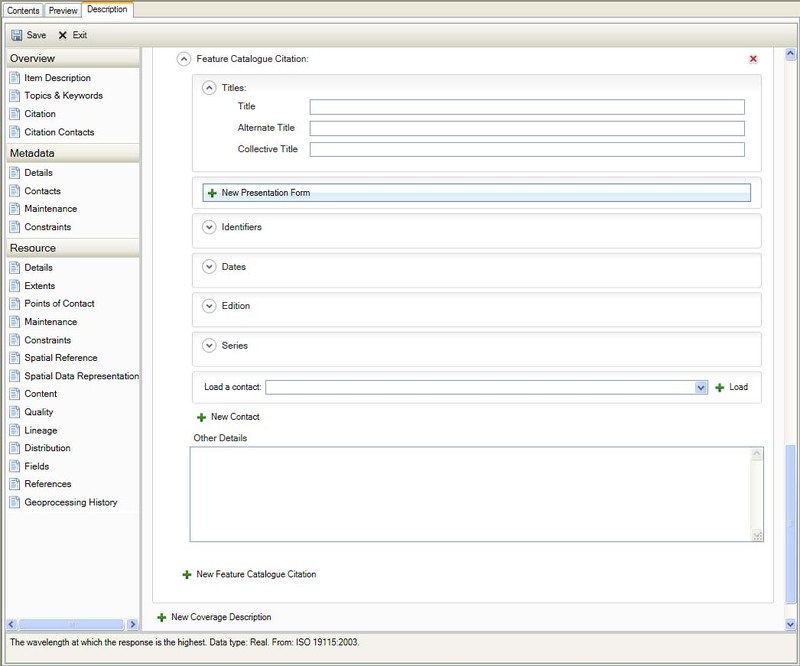 Specification The name of a subset, profile, or product specification of the format, if appropriate. Data type: CharacterString. From: ISO 19115:2003. Decompression Technique The algorithms or processes that must be applied to read or expand the distributed resource, if it was compressed. Data type: CharacterString. From: ISO 19115:2003. West The Western-most coordinate of the extent, expressed in decimal degrees longitude where positive values are East. Data type: Decimal, where the value, x, is -180.0 <= x <= 180.0. From: ISO 19115:2003/Cor. 1:2006. East The Eastern-most coordinate of the extent, expressed in decimal degrees longitude where positive values are East. Data type: Decimal, where the value, x, is -180.0 <= x <= 180. From: ISO 19115:2003/Cor. 1:2006. South The Southern-most coordinate of the extent, expressed in decimal degrees latitude where positive values are North. Data type: Decimal, where the value, x, is -90.0 <= x <= 90.0. From: ISO 19115:2003/Cor. 1:2006. North The Northern-most coordinate of the extent, expressed in decimal degrees latitude where positive values are North. Data type: Decimal, where the value, x, is -90.0 <= x <= 90.0. From: ISO 19115:2003/Cor. 1:2006. 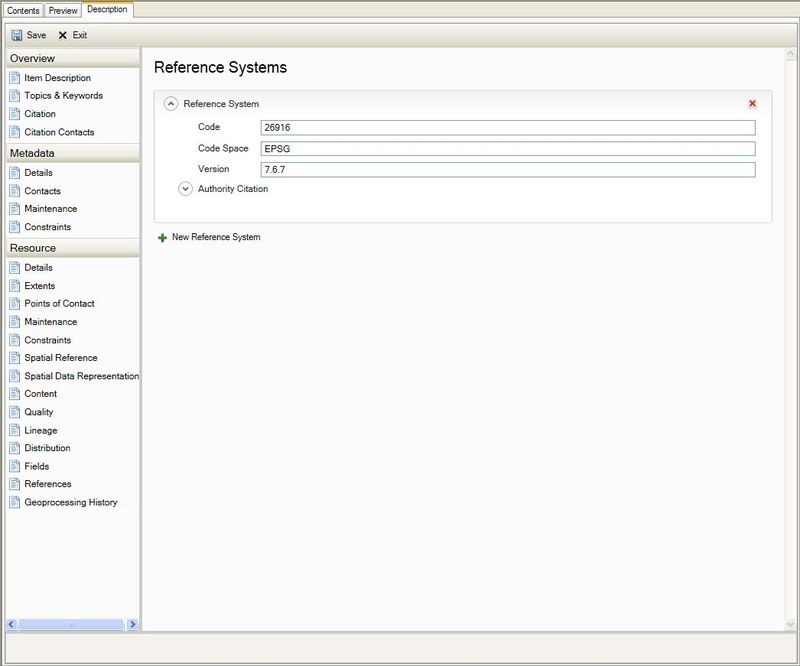 Identifier An alphanumeric value that identifies an authoratative reference, or an instance in a namespace. Data type: CharacterString. From: ISO 19115:2003. 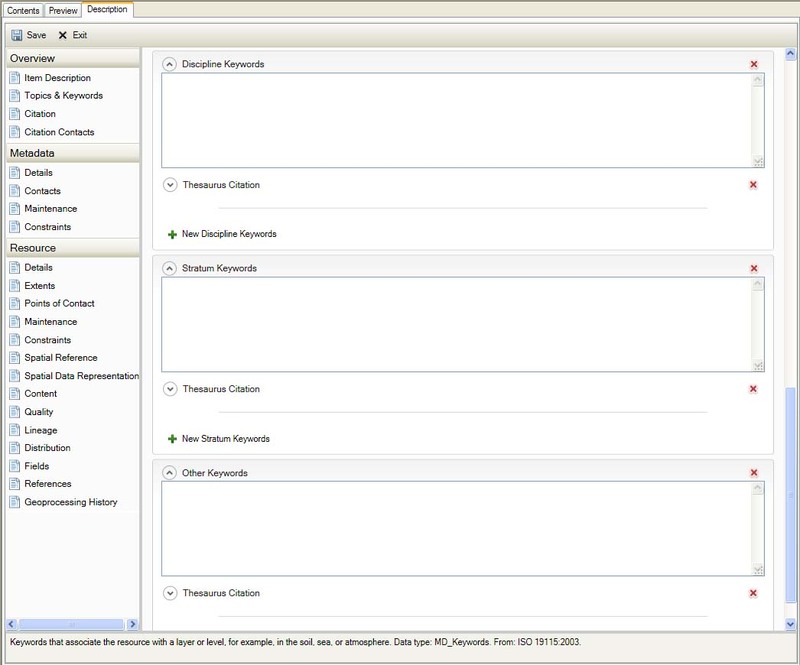 Attribute Identifies the instances of attribute types to which the information applies. Data type: GF_AttributeType. From: ISO 19115:2003/Cor. 1:2006. Use Limitation is repeatable. Describes limitations affecting the fitness of use of the resource; for example, "Not to be used for navigation." Data type: CharacterString. From: ISO 19115:2003. 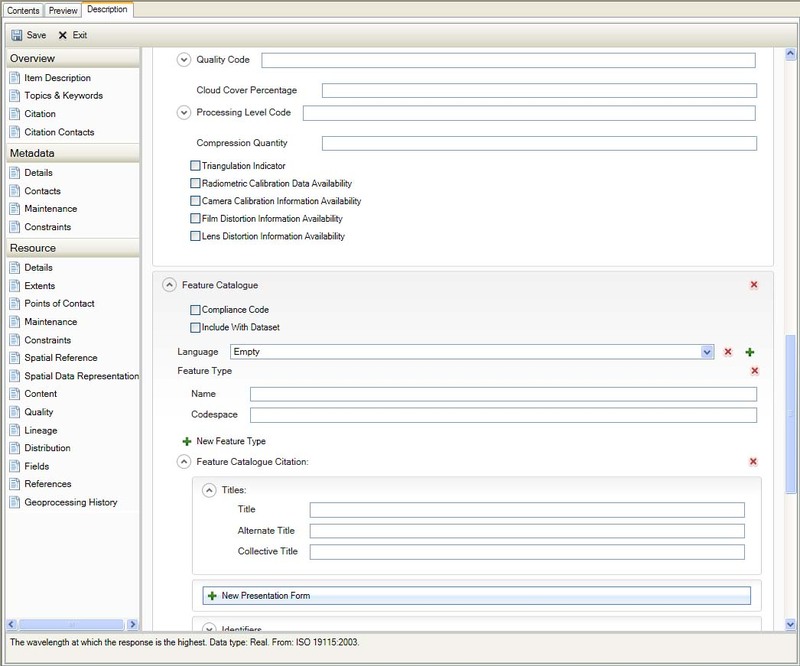 Classification Dropdown Identifies any handling restrictions on the resource or metadata. Data type: MD_ClassificationCode. From: ISO 19115:2003. Classification System The name of the classification system. Data type: CharacterString. From: ISO 19115:2003. 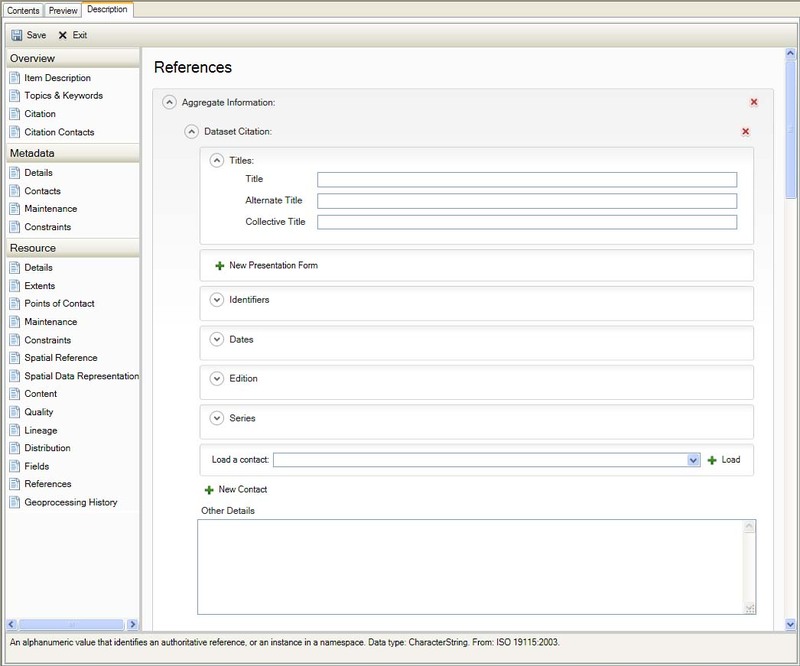 User Note Explains any legal restrictions and prerequisites for obtaining and using the resource or metadata. Data type: CharacterString. From: ISO 19115:2003. 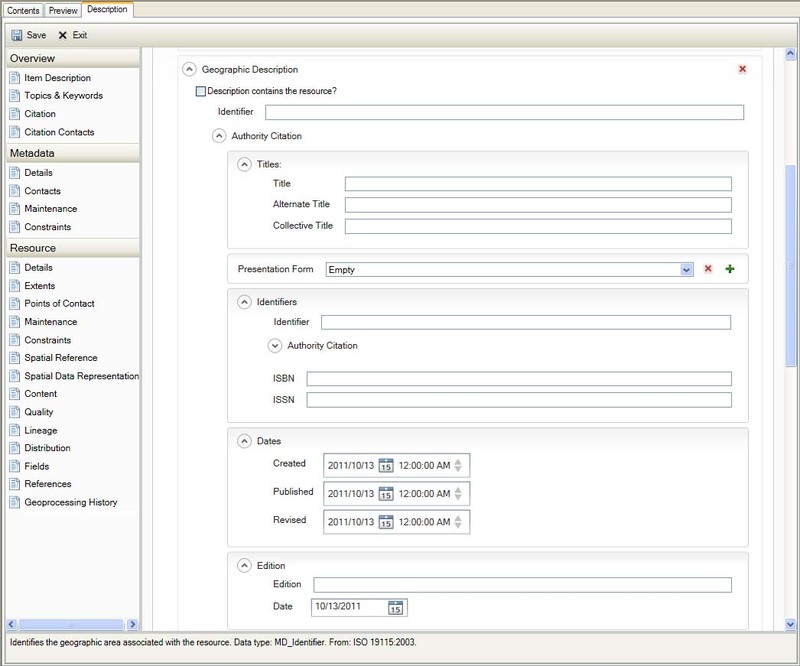 Handling Description Provides additional information about the restrictions on handing the resource or metadata. Data type: CharacterString. From: ISO 19115:2003. Number of Dimensions The number of independent spatial and temporal axes represented in the data. Data type: Integer. From: ISO 19115:2003. Size The number of elements along the axis. Data type: Integer. From: ISO 19115:2003. Transformation Dimension Description Describes the transformation that was performed to georectify the raster. Data type: CharacterString. From: ISO 19115:2003. Transformation Dimension Mapping Describes the geographic position points used to test the accuracy of the georeferenced raster data. A description must be provided if check points are available. Data type: CharacterString. From: ISO 19115:2003. Orientation Parameter Description Describes the parameters that in turn describe a sensor's orientation. Data type: CharacterString. From: ISO 19115:2003. 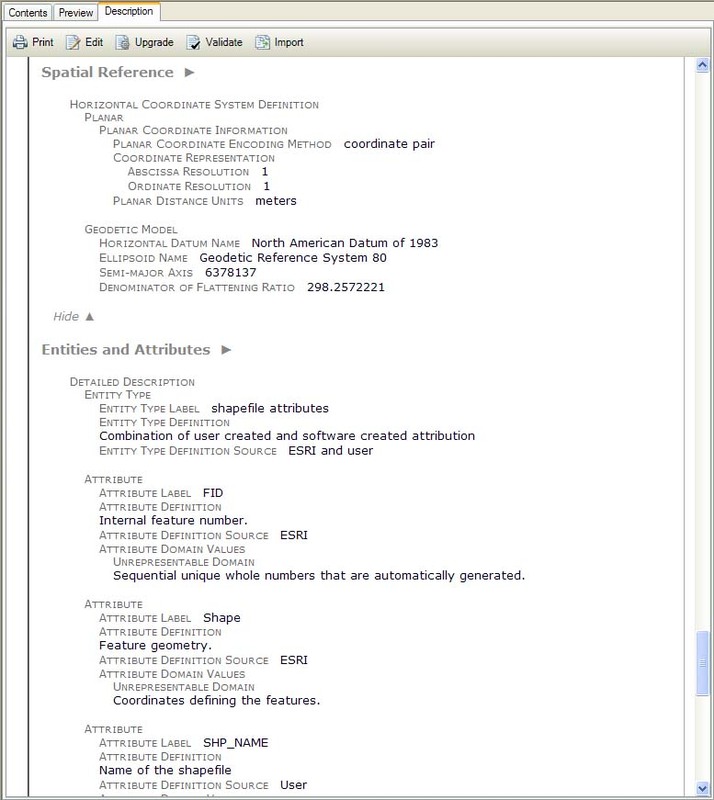 Georeferenced Parameter Describes the parameters that support georeferencing for the raster data. Data type: Record. From: ISO 19115:2003. Geometric Objects The total number of the given type of objects in the dataset. Data type: Integer greater than zero. From: ISO 19115:2003. 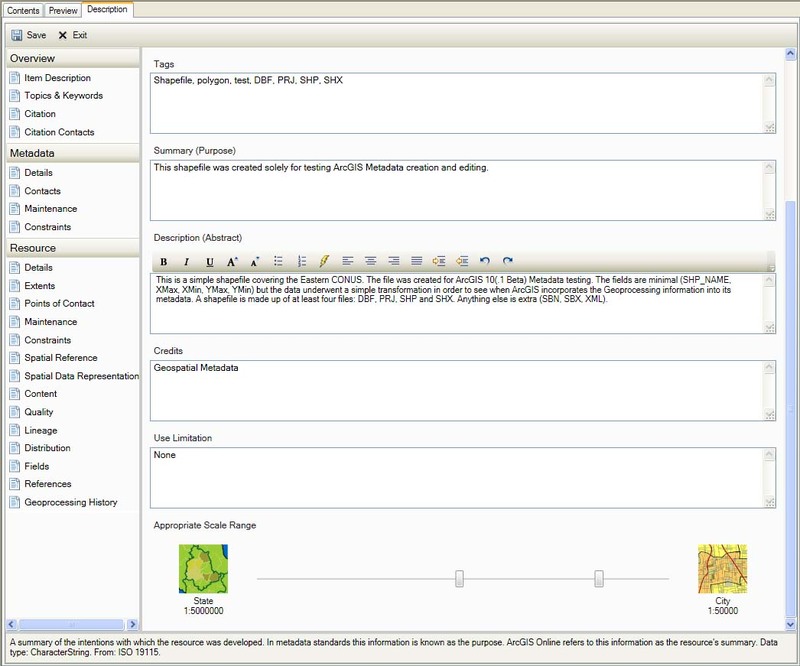 Attribute Description Identifies the information conveyed by the raster data. Data type: RecordType. From: ISO 19115:2003. Sequence Identifier / Type A number that uniquely identifies instances of bands of wavelengths on which a sensor operates. Data type: MemberName. From: ISO 19115:2003. Descriptor Describes the range of values possible for this set of cells. Data type: CharacterString. From: ISO 19115:2003. Min Value The shortest wavelength the sensor is capable of collecting in this band. Data type: Real. From: ISO 19115:2003. Max Value The longest wavelength the sensor is capable of collecting in this band. Data type: Real. From: ISO 19115:2003. Peak Response The wavelength at which the response is the highest. Data type: Real. From: ISO 19115:2003. Bits per Value The maximum number of significant bits in the uncompressed representation of the cell value. Data type: Integer. From: ISO 19115:2003. Tone Gradation The number of discrete numerical values. Data type: Integer. From: ISO 19115:2003. Scale Factor The physical value corresponding to a cell value of zero. Data type: Real. From: ISO 19115:2003. Offset The physical value corresponding to a cell value of zero. Data type: Real. From: ISO 19115:2003. Illumination Elevation Angle The illumination elevation, measured in degrees clockwise from the target plane at intersection of the optical line of sight with the Earth's surface. For images from a scanning device, refer to the centre pixel of the image. Data type: Real numbers between -90.0 and 90.0. From: ISO 19115:2003. Illumination Azimuth Angle The illumination azimuth measured in degrees clockwise from true North at the time the image is taken. For images from a scanning device, refer to the centre pixel of the image. Data type: Real numbers between 0.0 and 360.0. From: ISO 19115:2003. Cloud Cover Percentage Describes the area of the image that is obscured by clouds, expressed as a percentage of the image's horizontal extent. Data type: Real numbers between 0.0 and 100.0. From: ISO 19115:2003. Compression Quantity The total number of lossy compression cycles that have been performed on the image. Data type: Integer. From: ISO 19115:2003. Feature Type is repeatable. 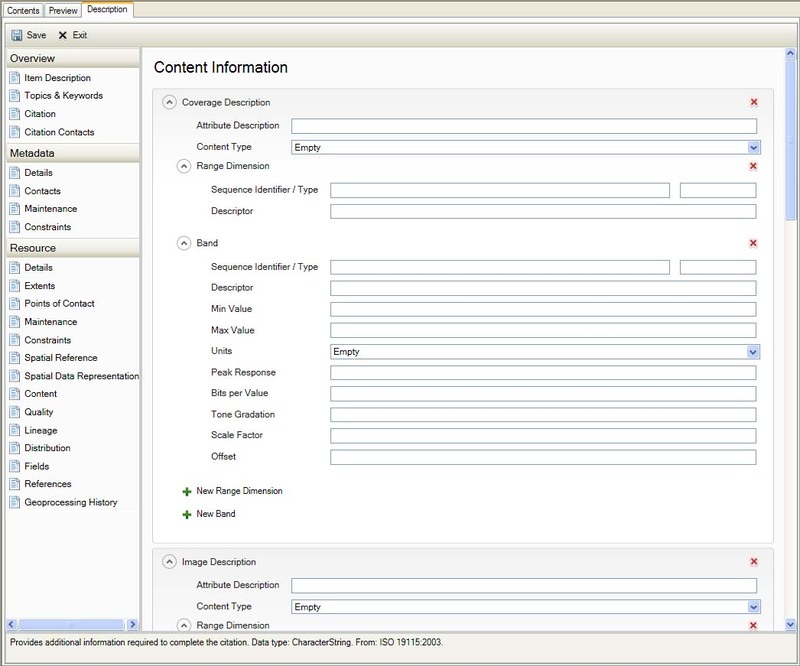 Identifies the feature types described by the feature catalog that occur in the resource. Data type: CharacterString. From: ISO 19115:2003. 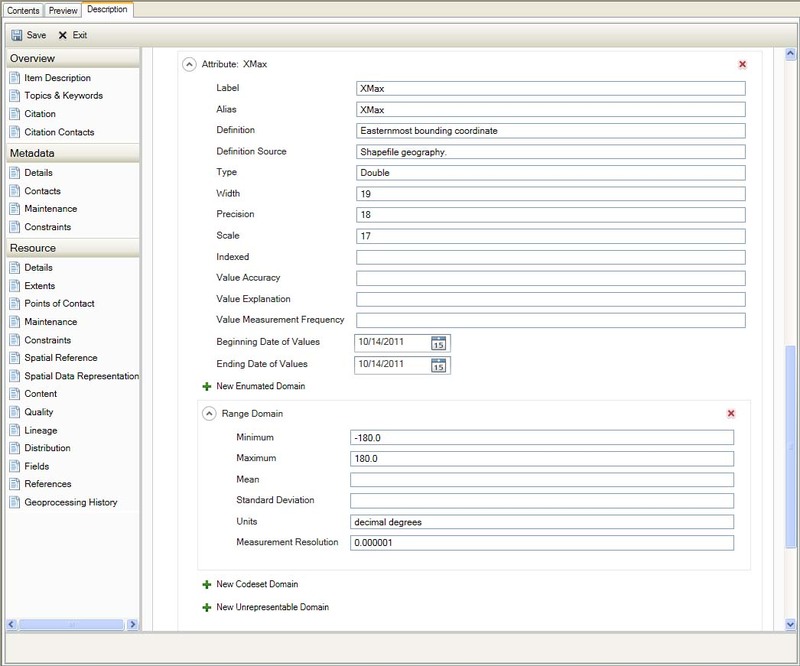 Attribute Instances Identifies the attriute instances to which the information applies. Data type: GF_AttributeType. From: ISO 19115:2003. 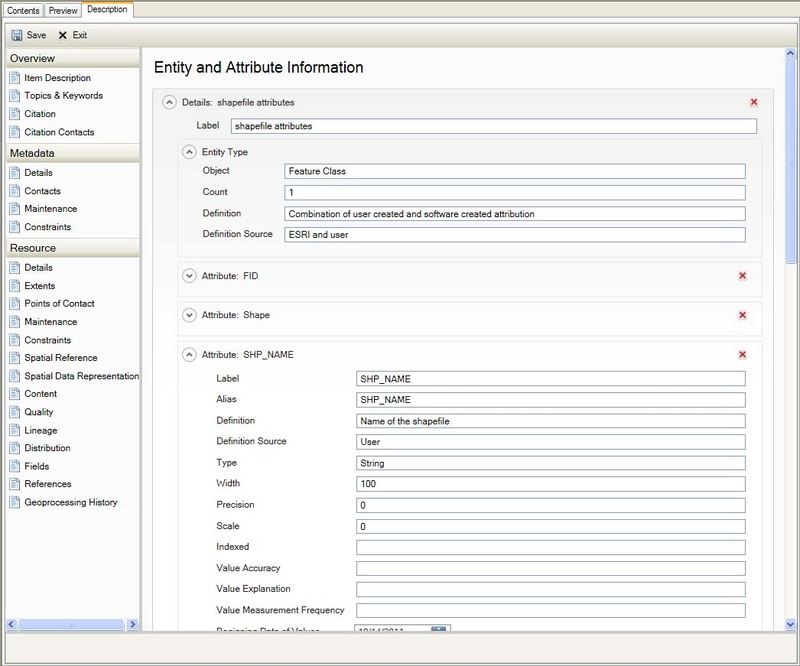 Features Identifiees instances of feature types to which the information applies. Data type: GF_AttributeType. From: ISO 19115:2003/Cor. 1:2006. Measure Date (Identifies the date and time when the data quality was measured. Data type: DateTime. From: ISO 19115:2003.) is repeatable. Name (The name of the test applied to the data to measure its quality. Data type: CharacterString. From: ISO 19115:2003.) is repeatable. 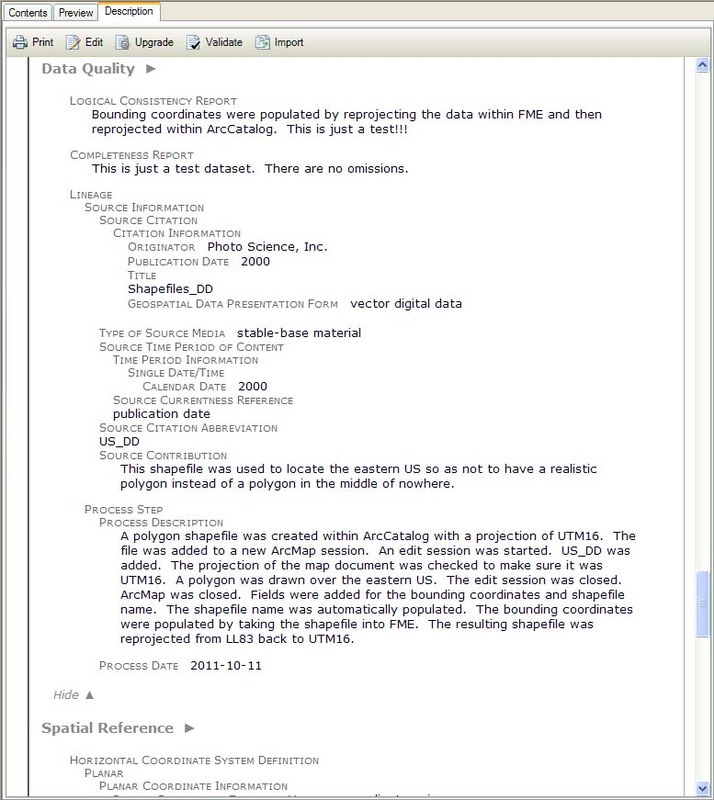 Description A description of the data quality measure. Data type: CharacterString. From: ISO 19115:2003. Description A description of the evaluation method. Data type: CharacterString. From: ISO 19115:2003. Explanation An explanation of the meaning of conformance for this result. Data type: CharacterString. From: ISO 19115:2003. 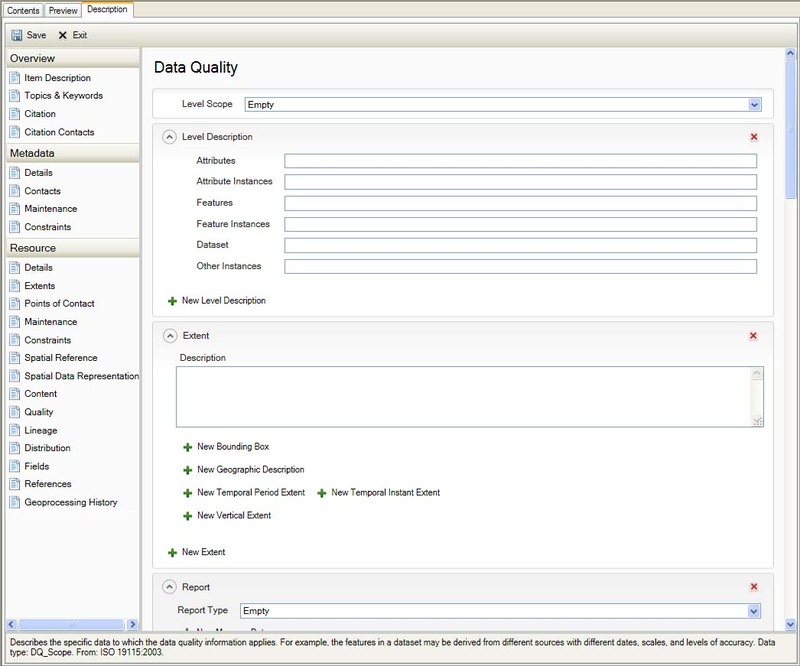 Value Type The type of value used to report a data quality result; for example, a covariance matrix. Data type: RecordType. From: ISO 19115:2003. Value (The quantitative values determined by the evaluation procedure used. Data type: Record. From: ISO 19115:2003.) is repeatable. Error Statistic The statistical method used to determine the value. Data type: CharacterString. From: ISO 19115:2003. Statement Provides a general description of the resource's lineage. 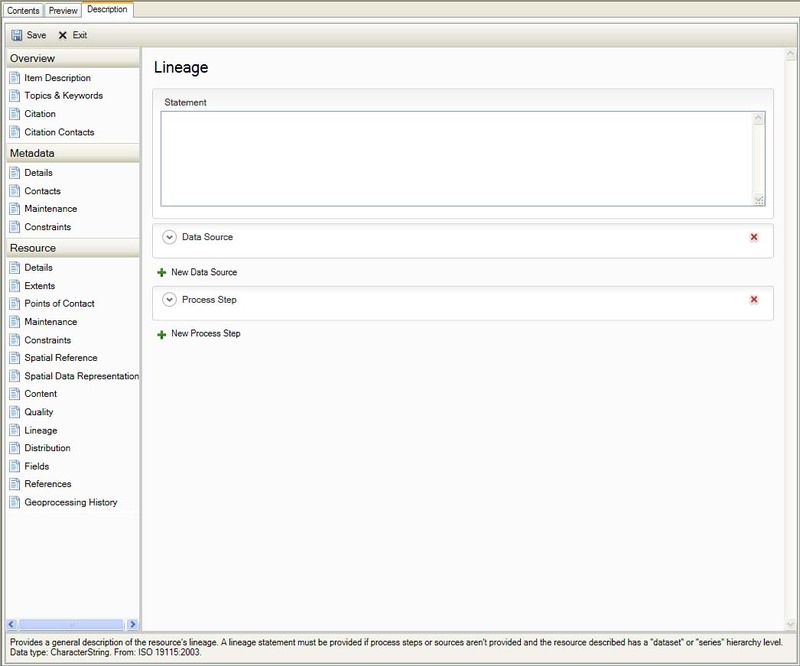 A lineage statement must be provided if process steps or sources aren't provided and the resource described has "dataset" or "series" hierarchy level. Data type: CharacterString. From: ISO 19115:2003. Source Description A detailed description of the source. A description or extent must be provided to describe the source. Data type: CharacterString. From: ISO 19115:2003. Scale Denominator The scale of the spatial information provided by the source. Data type: MD_RepresentativeFraction. From: ISO 19115:2003. Code An alphanumeric value that identifies an authoratative reference, or an instance in a namespace. Data type: CharacterString. From: ISO 19115:2003. 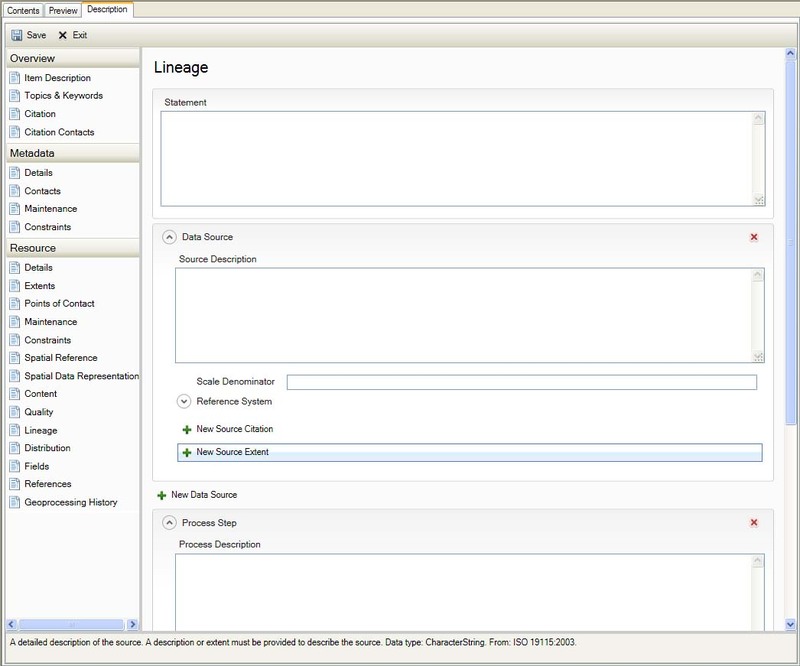 Code Space The name or identifier of the authority responsible for the refrence or namespace. 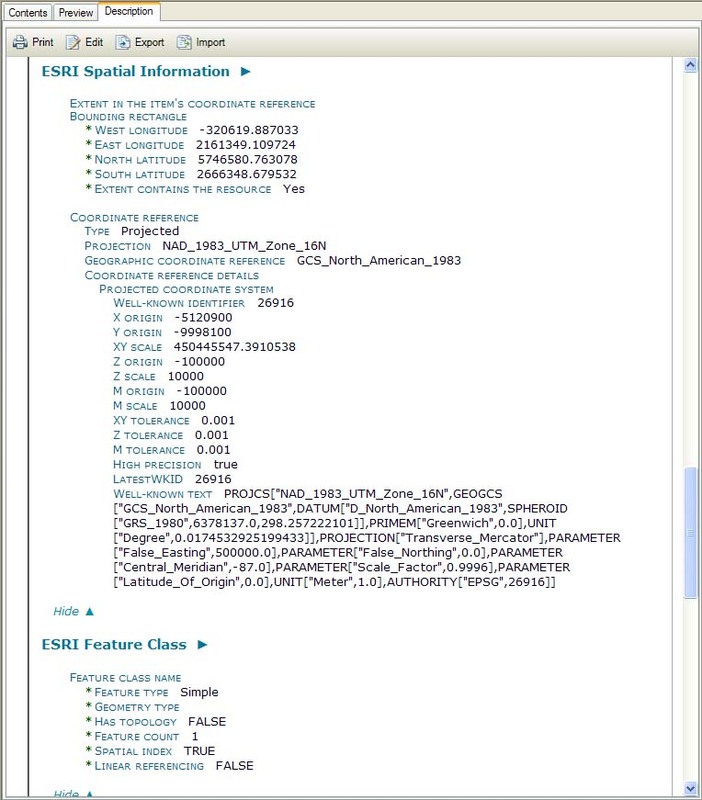 For example, if the code identifies an EPSG-defined spatial reference the codespace would be 'EPSG.' Data type: CharacterString. From: ISO 19115:2003. Version The version of the detailed reference associated with the code. 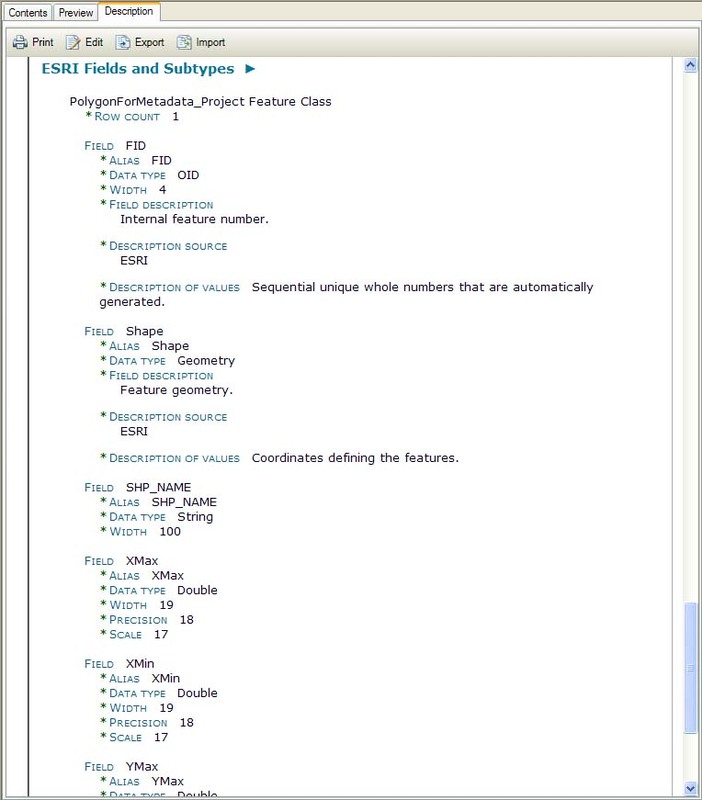 For example, if the code identifies an EPSG-defined spatial reference the codespace would be the version number of the EPSG database to which the coded value refers. Data type: CharacterString. From: ISO 19115:2003. Process Description Describes the event, transformation, or process that occurred while maintaining the resource, including any parameters or tolerances that were used. Data type: CharacterString. From: ISO 19115:2003. Rationale Describes why the process step occurred. Data type: CharacterString. From: ISO 19115:2003. 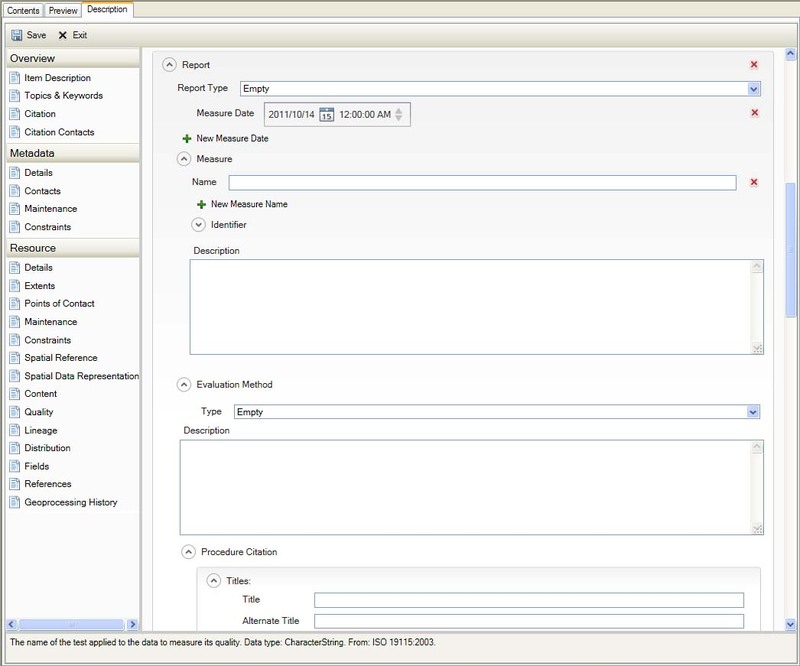 Date Identifies the date and time when the process step occurred. Data type: CharacterString. From: ISO 19115:2003. 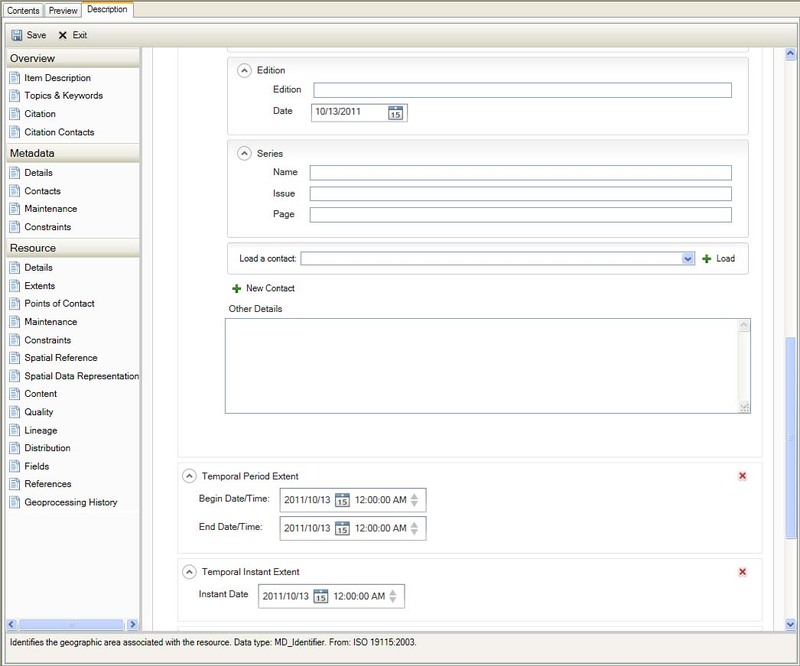 Format Version The version of the transfer format, if appropriate; for example, a date or number. Data type: CharacterString. From: ISO 19115:2003. Amendment Number An amendment number for this version of the format. Data type: CharacterString. From: ISO 19115:2003. Decompression Technique The algorithms or processes that must be applied to read or expand the distributed resource, if it was compressed. DataType: CharacterString. From: ISO 19115:2003. Available Date The date and time when the resource will be available. Data type: DateTime. From: ISO 19115:2003. Ordering Instructions Describes instructions, terms, and services provided by the distributor. Data type: CharacterString. From: ISO 19115:2003. Turnaround Describes the typical period of time in which an order can be fulfilled. Data type: CharacterString. From: ISO 19115:2003. Units of Distribution The units in which the resource is available; for example, the units may be tiles, layers, or geographic areas. Data type: CharacterString. From: ISO 19115:2003. Transfer Size The estimated size of a unit in the specified transfer format, expressed in megabytes. Data type: Real numbers greater than 0.0. From: ISO 19115:2003. Protocol The protocol to be used when accessing the online resource. Data type: CharacterString. From: ISO 19115:2003. Density (The density at which the data is recorded. Data type: Real numbers greater than 0.0. From: ISO 19115:2003.) is repeatable. Density Units The units of measure for recording density. Units must are required if a density has been provided. Data type: CharacterString. From: ISO 19115:2003. Volumes The number of items in the media identified. Data type: Integer numbers greater than 0. From: ISO 19115:2003/Cor. 1:2006. Medium Note Describes any limitations or requirements for using the medium. Data type: CharacterString. From: ISO 19115:2003. Tool Info (Input and Results). 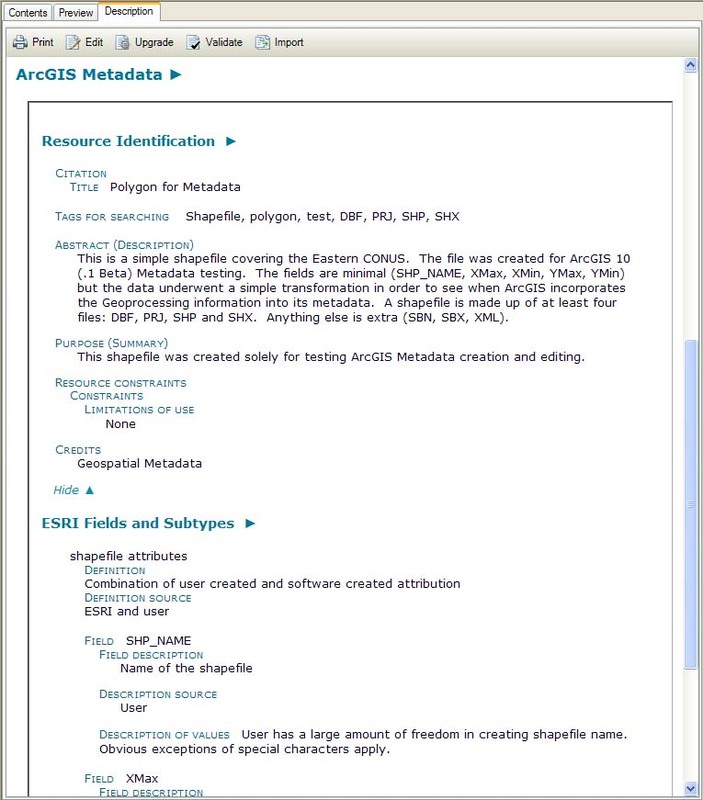 ArcGIS 10.1 Display of Metadata on the Shapefile. 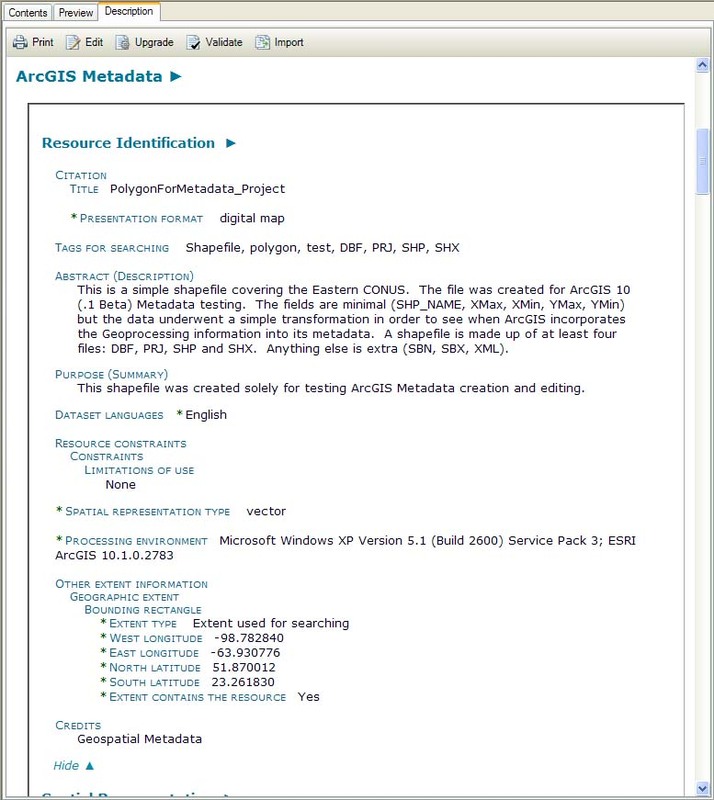 ArcGIS 10.1 Display of Metadata from the Simple FGDC-Compliant XML template. 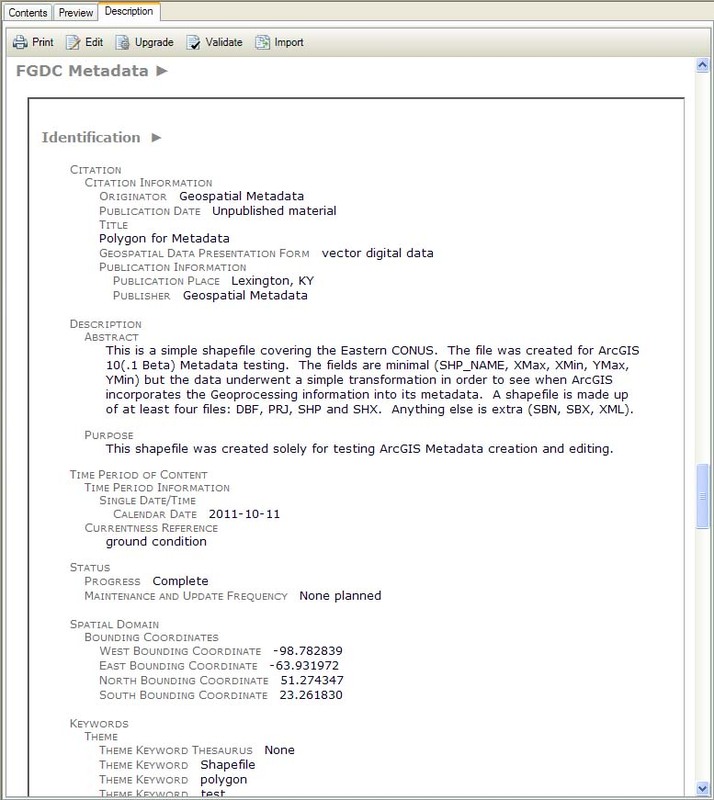 ArcGIS 10.1 Display of Metadata on Shapefile onto which the simple FGDC-Compliant XML template was successfully imported. Import Metadata Fail Results, part 1. Import Metadata Fail Results, part 2. 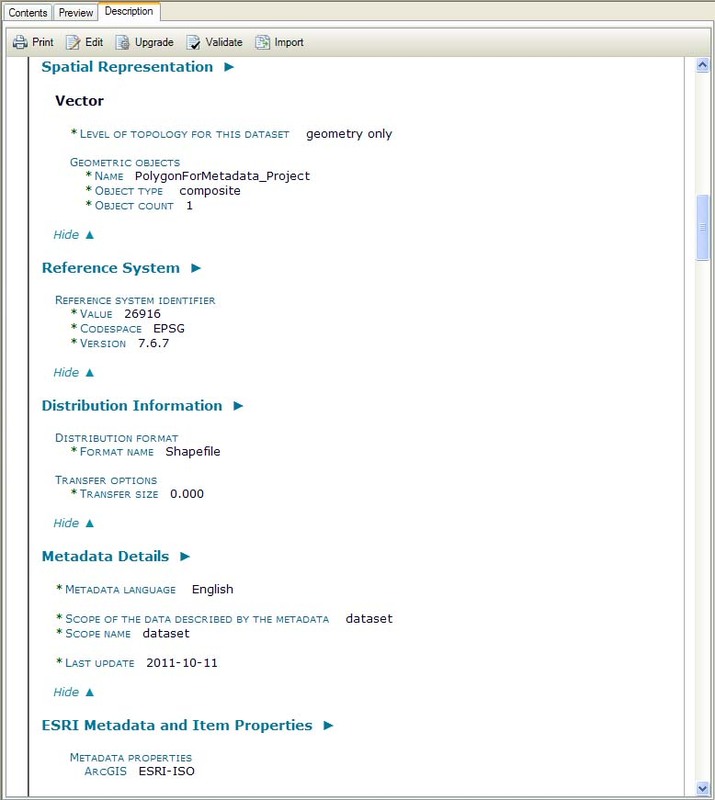 Initial view of the shapefile metadata. 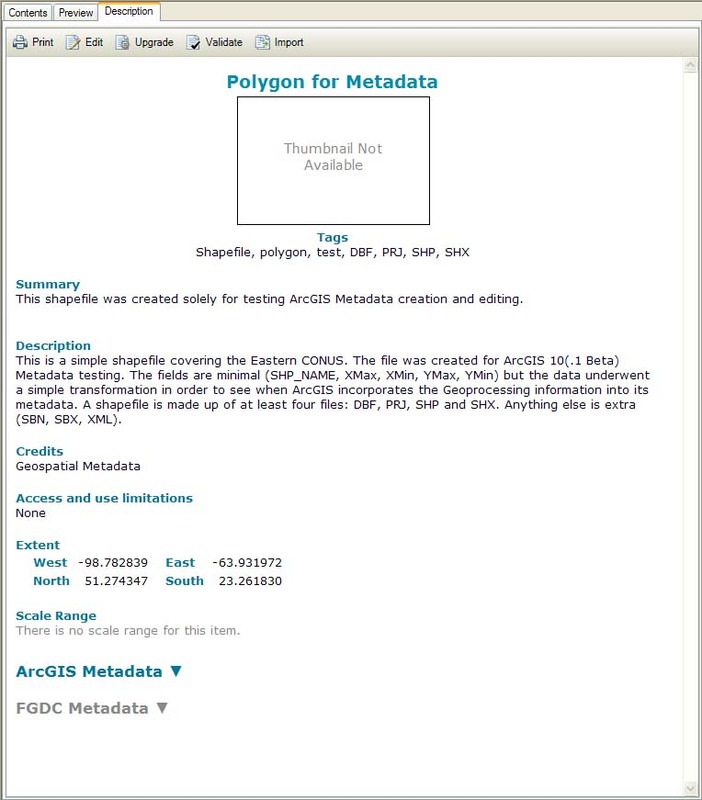 Shapefile ArcGIS metadata, part 1. 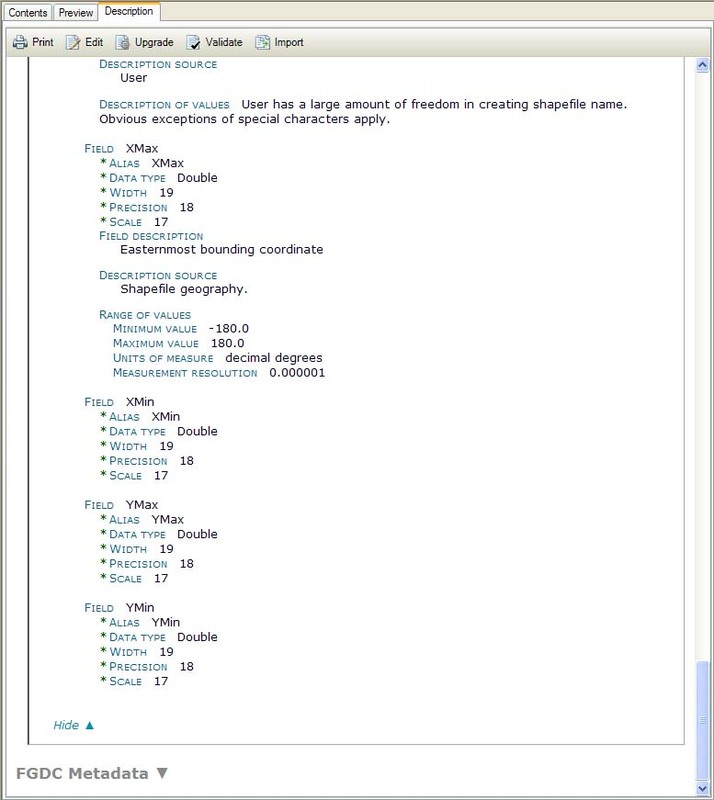 Shapefile ArcGIS metadata, part 2. Shapefile ArcGIS metadata, part 3. 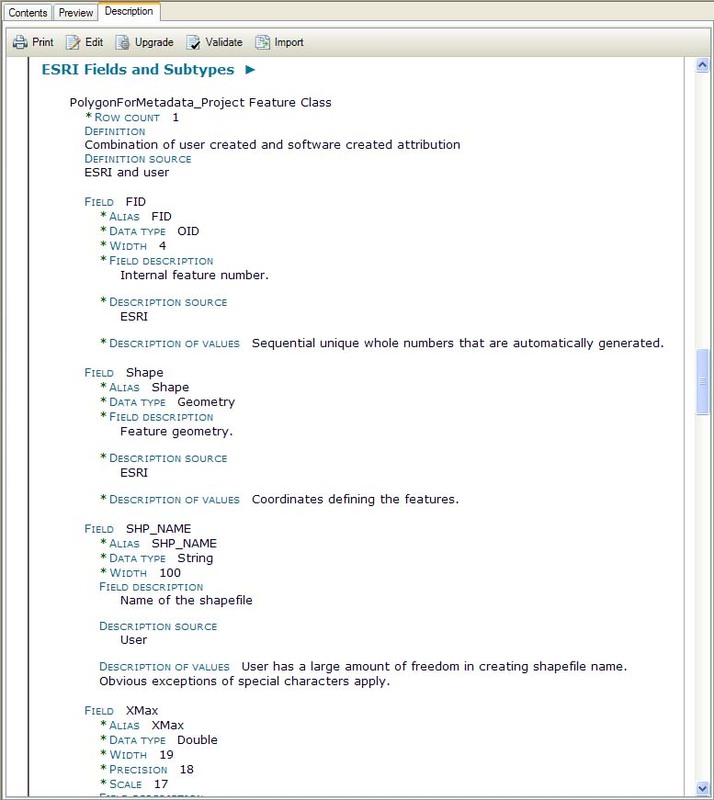 Shapefile ArcGIS metadata, part 3 and a half. 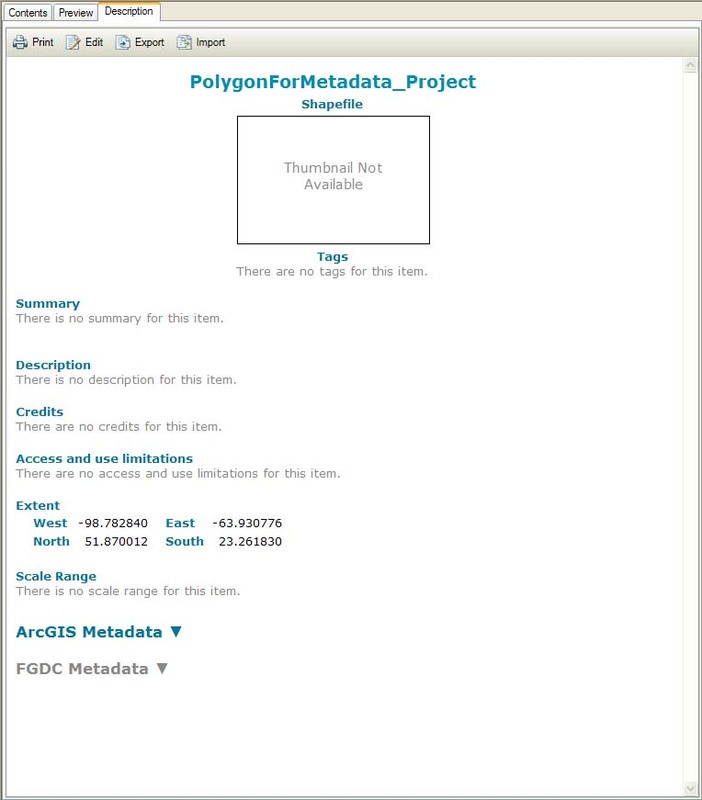 Shapefile ArcGIS metadata, part 4. 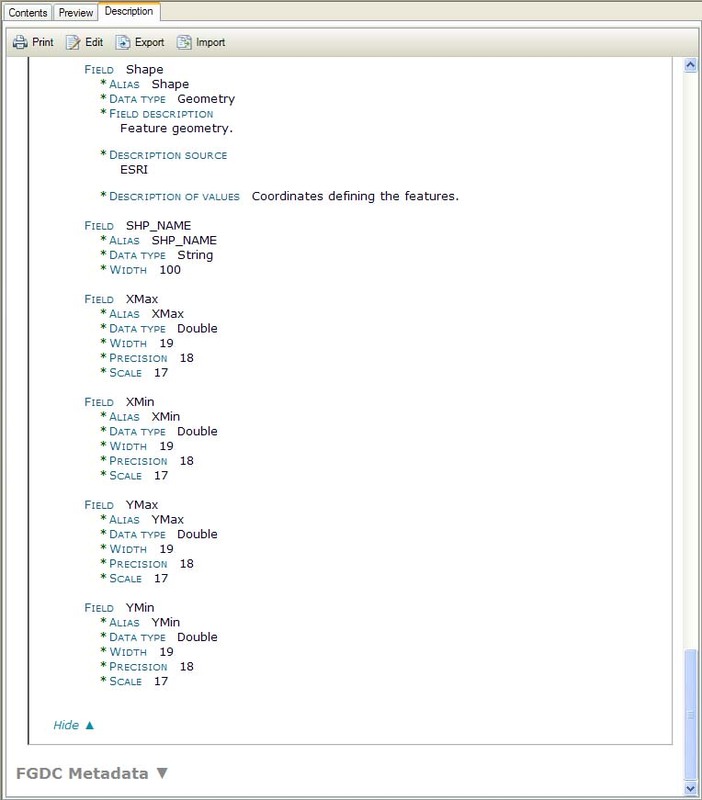 Shapefile ArcGIS metadata, part 4 and a half. Shapefile ArcGIS metadata, part 5. 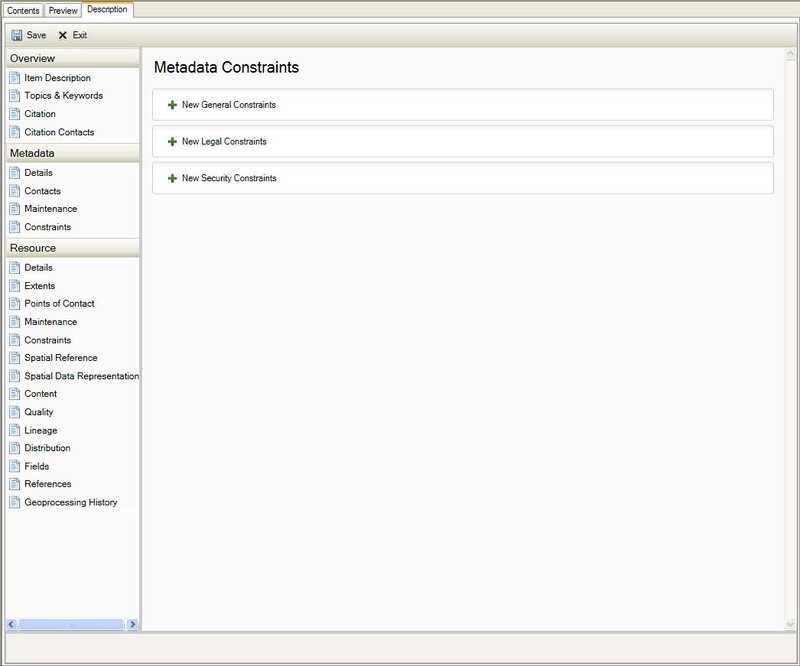 Initial view of the simple template metadata. 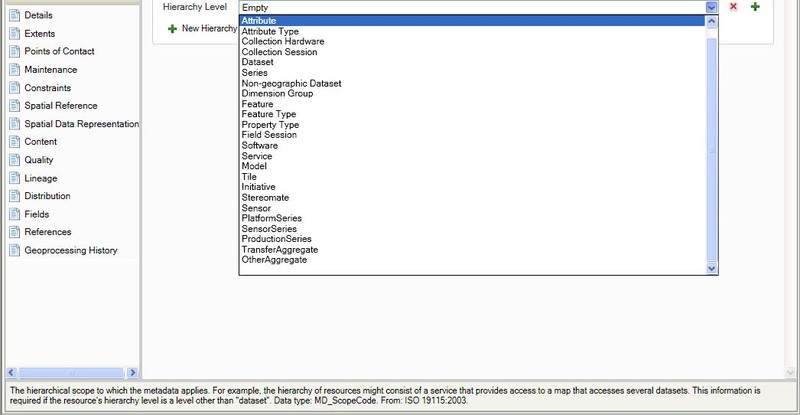 Template ArcGIS metadata, part 1. 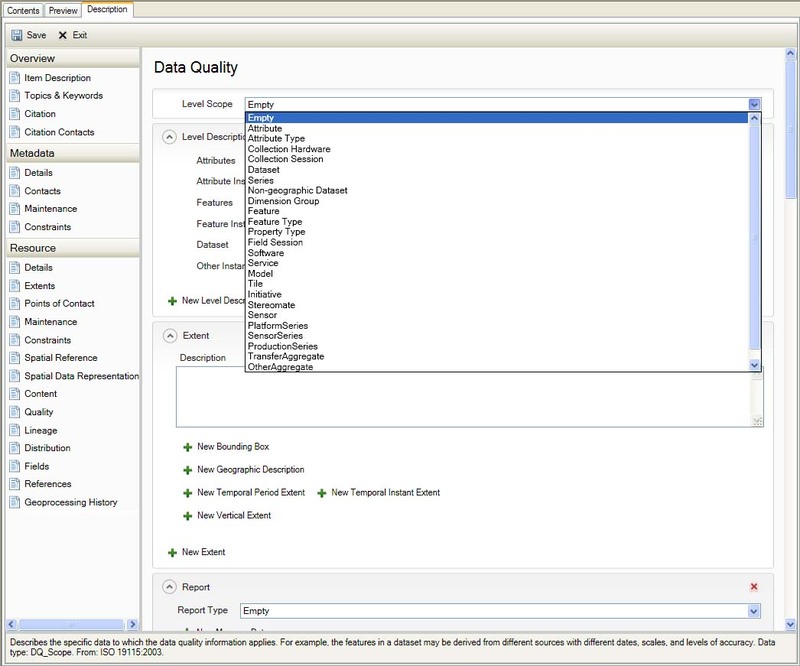 Template ArcGIS metadata, part 2. Template FGDC metadata, part 1. 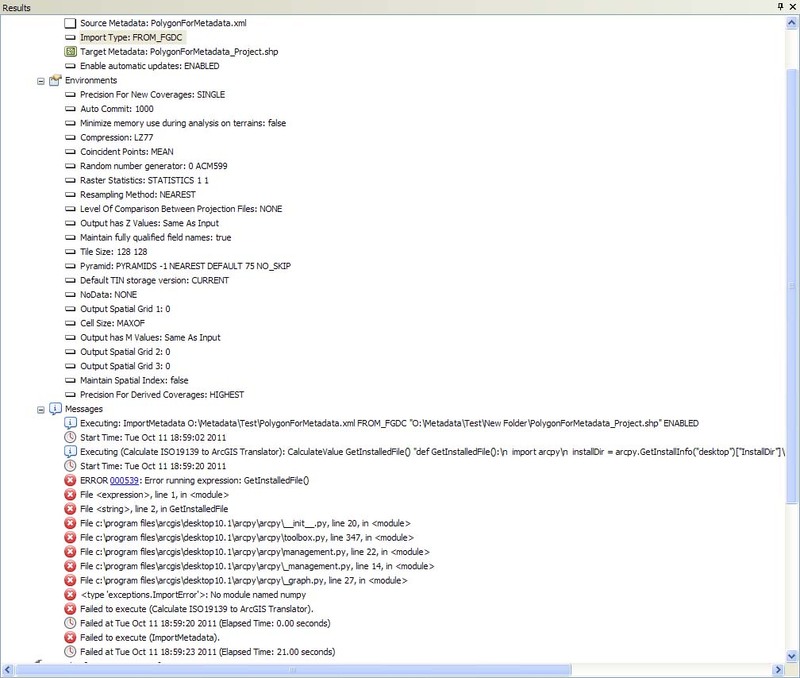 Template FGDC metadata, part 2. 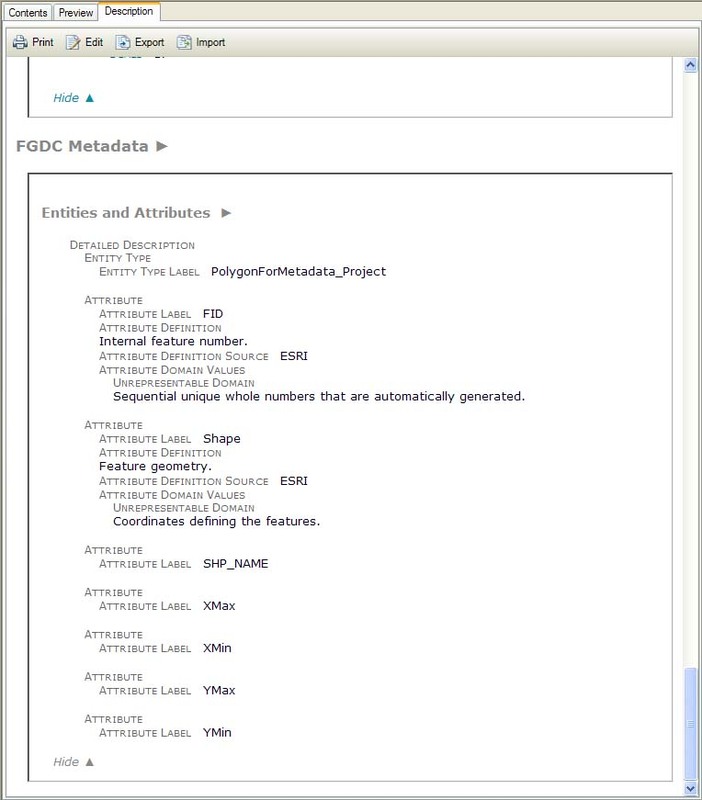 Template FGDC metadata, part 3. Template FGDC metadata, part 4. 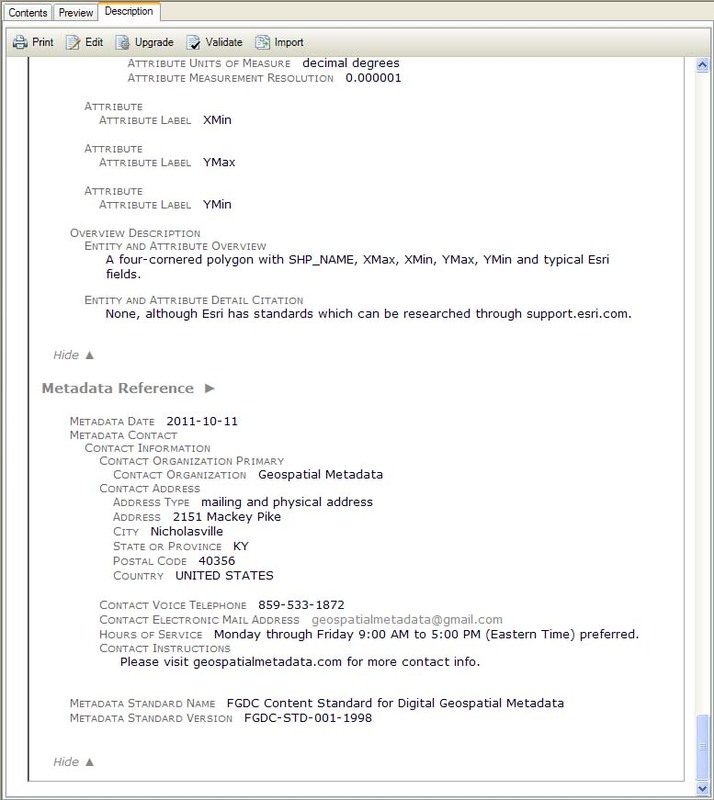 Template FGDC metadata, part 5. 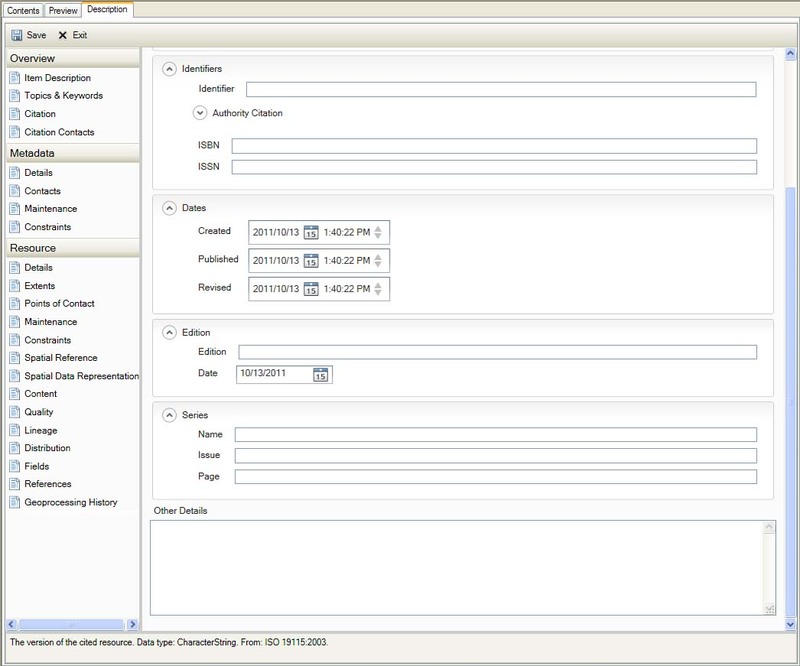 Initial view of the imported metadata. 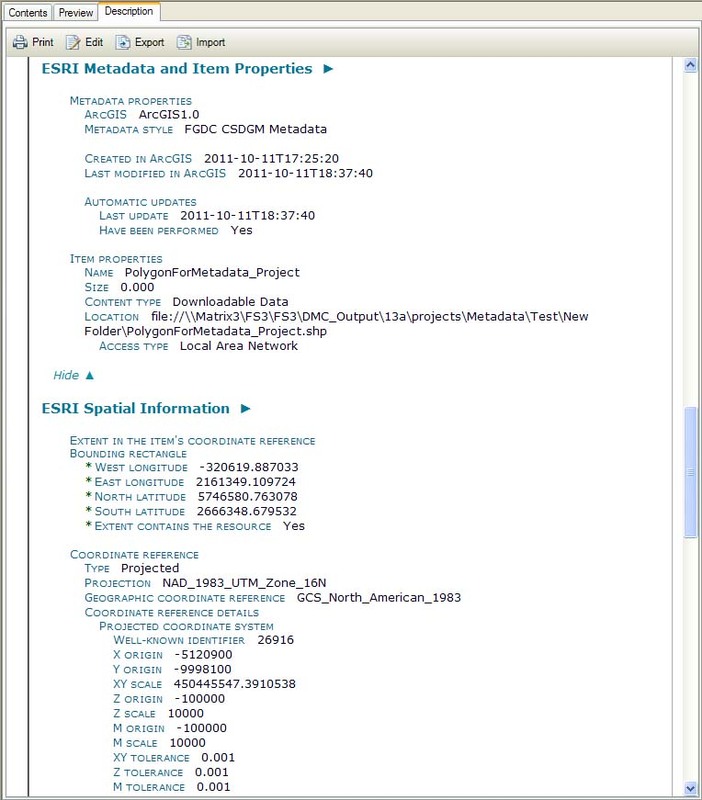 Imported ArcGIS metadata, part 1. 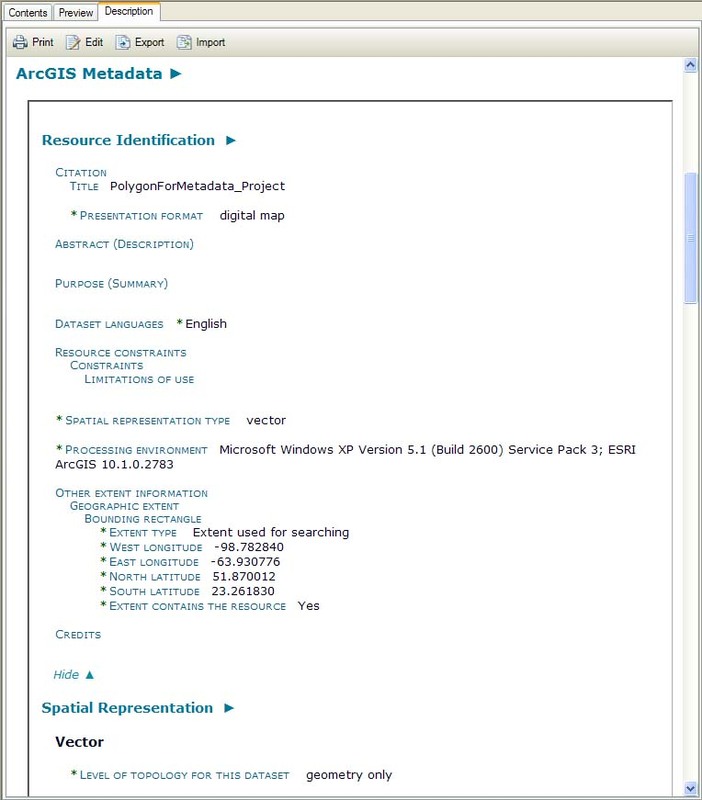 Imported ArcGIS metadata, part 2. 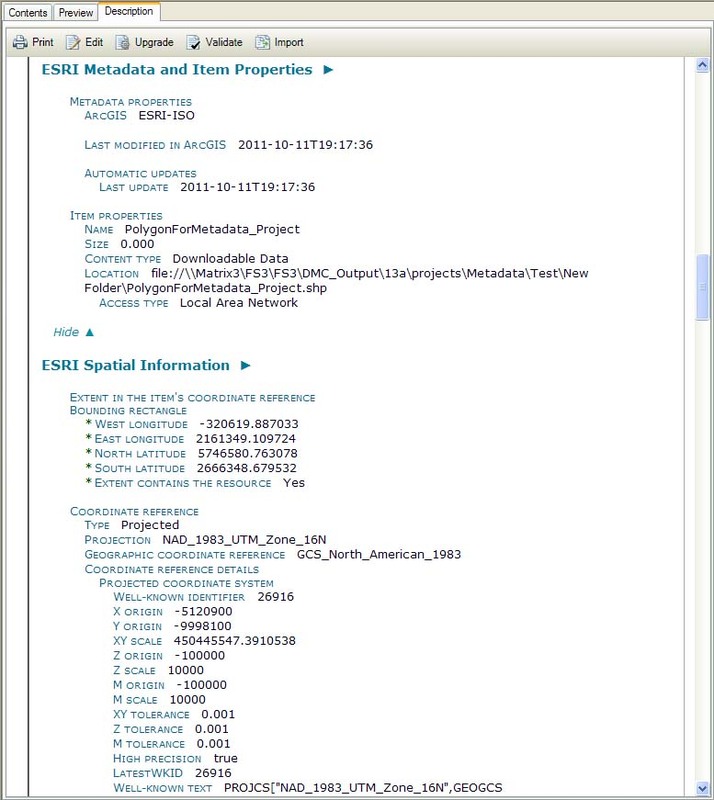 Imported ArcGIS metadata, part 3. 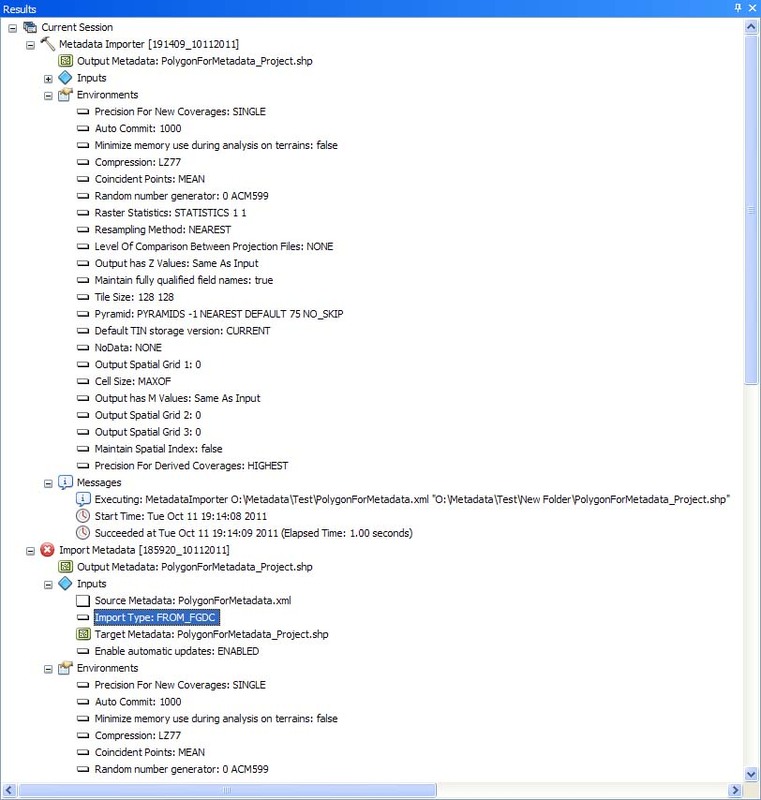 Imported ArcGIS metadata, part 3 and a half. 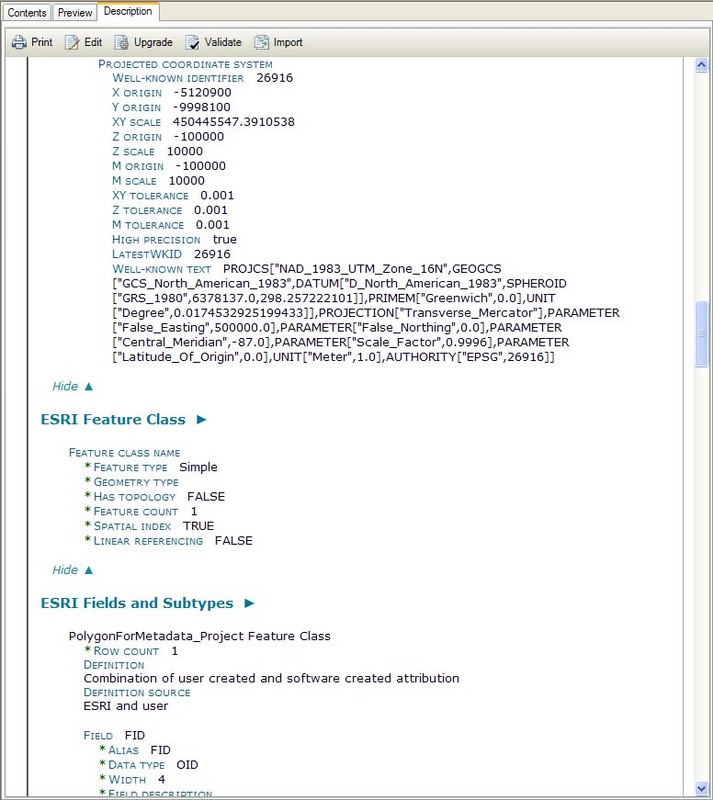 Imported ArcGIS metadata, part 4. 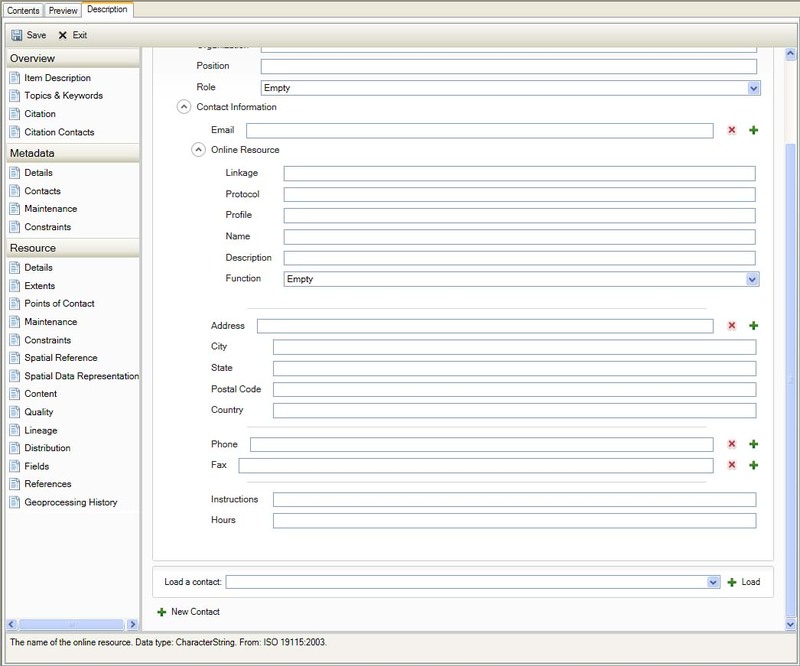 Imported ArcGIS metadata, part 5. 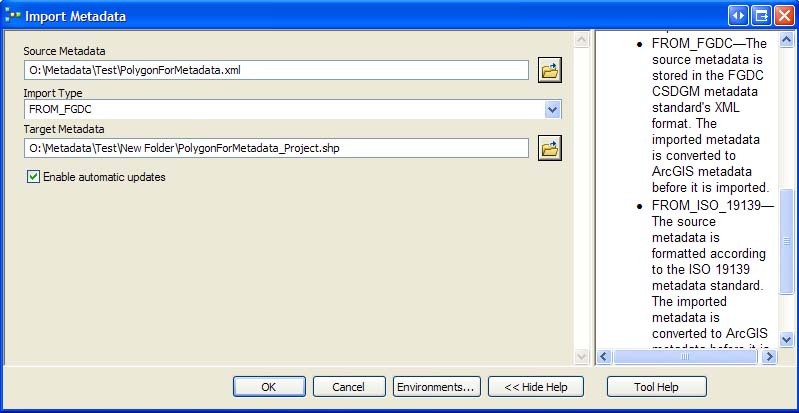 Imported ArcGIS metadata, part 6. Imported FGDC metadata, part 1. Imported FGDC metadata, part 2. Imported FGDC metadata, part 3. Imported FGDC metadata, part 4. Imported FGDC metadata, part 5. Imported FGDC metadata, part 6. 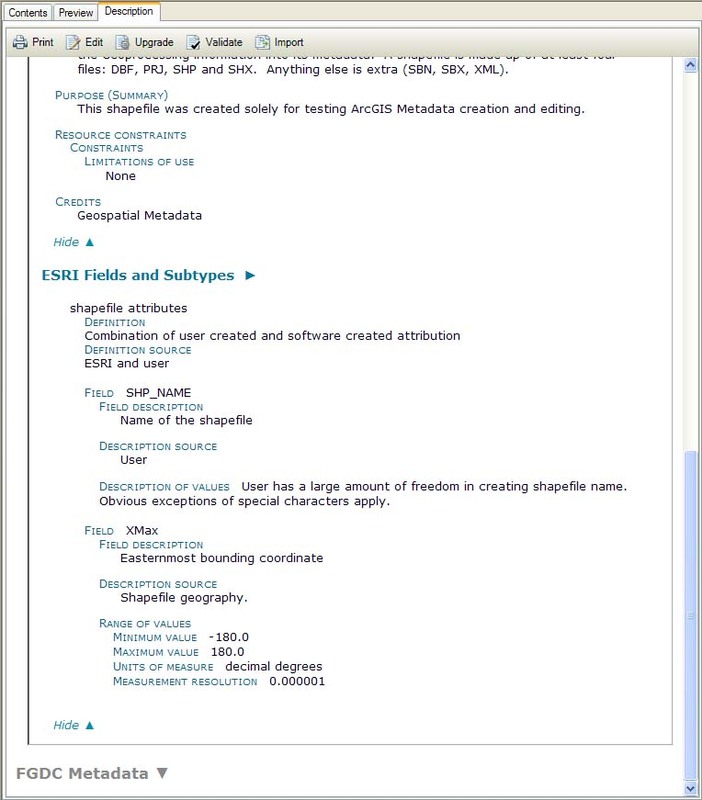 ArcGIS Metadata Editor on unimported shapefile. 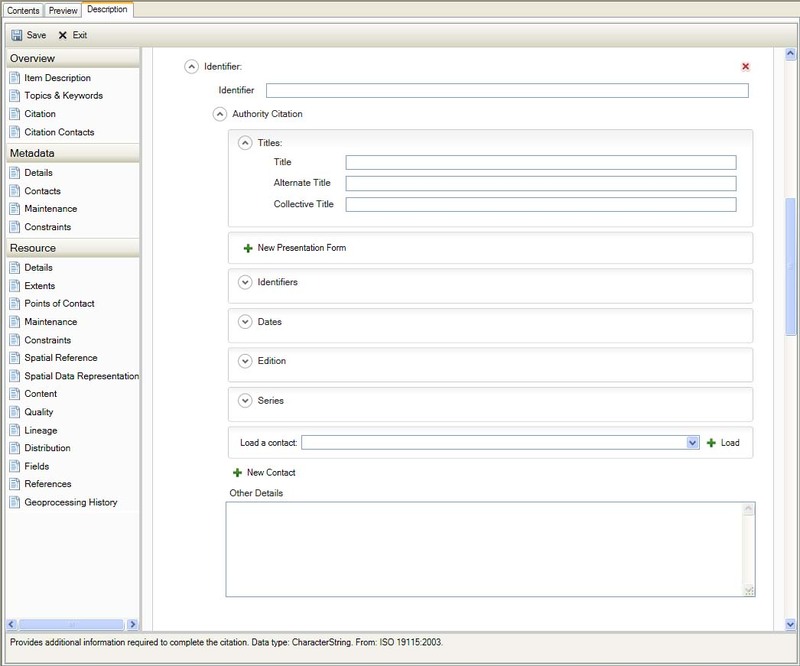 ArcGIS Metadata Editor on simple FGDC-Compliant XML metadata template.